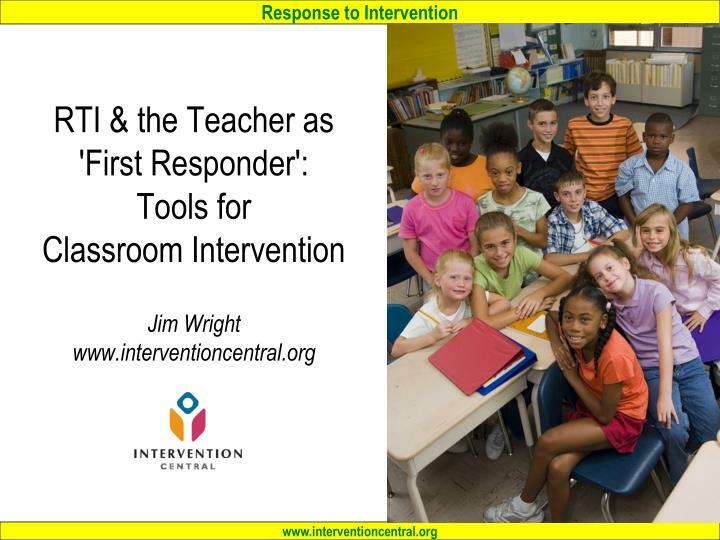 RTI & the Teacher as 'First Responder': Tools for Classroom Intervention Jim Wright www.interventioncentral.org. 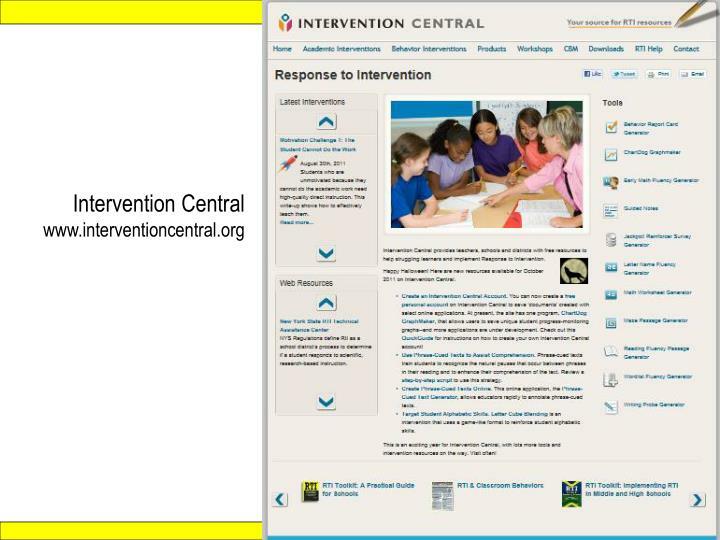 Intervention Central www.interventioncentral.org. 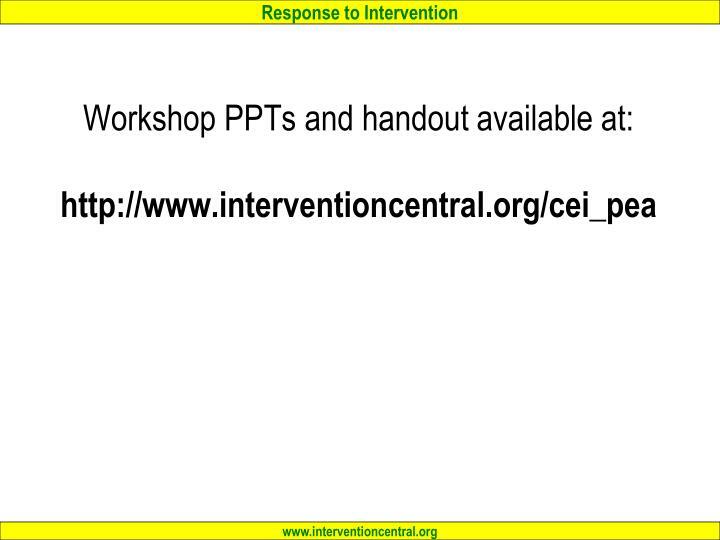 Workshop PPTs and handout available at: http://www.interventioncentral.org/cei_pea. 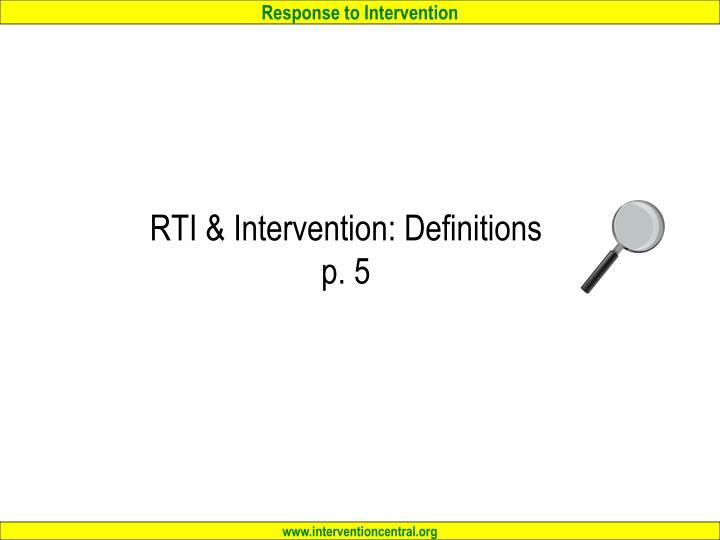 RTI: Key Concepts. Source: Batsche, G. M., Castillo, J. M., Dixon, D. N., & Forde, S. (2008). Best practices in problem analysis. In A. Thomas & J. Grimes (Eds. 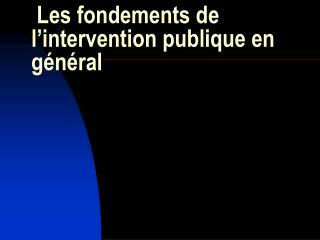 ), Best practices in school psychology V (pp. 177-193). 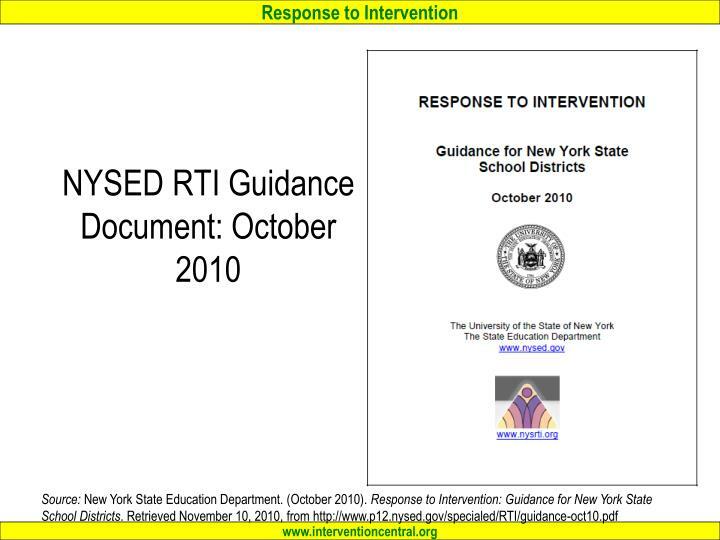 Only when the student shows through well-documented interventions that he or she has ‘failed to respond to intervention’ does RTI begin to investigate the possibility that the student may have a learning disability or other special education condition. “Decision points to determine if students are performing significantly below the level of their peers in academic and social behavior domains"
“Ongoing monitoring of student progress"
“Evaluation for special education services if students do not respond to intervention instruction"
Source: Fairbanks, S., Sugai, G., Guardino, S., & Lathrop, M. (2007). 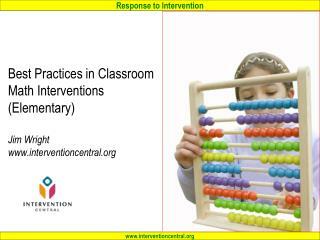 Response to intervention: Examining classroom behavior support in second grade. Exceptional Children, 73, p. 289. Is universal—available to all students. Can be delivered within classrooms or throughout the school. Is an ongoing process of developing strong classroom instructional practices to reach the largest number of struggling learners. 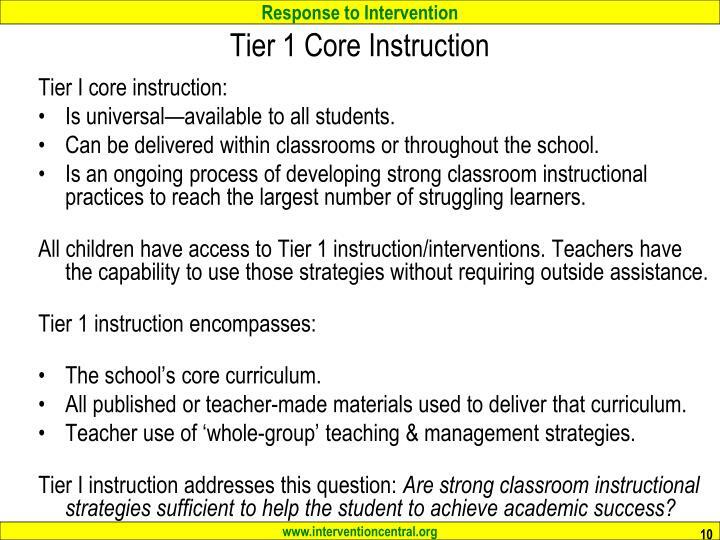 All children have access to Tier 1 instruction/interventions. Teachers have the capability to use those strategies without requiring outside assistance. All published or teacher-made materials used to deliver that curriculum. Teacher use of ‘whole-group’ teaching & management strategies. 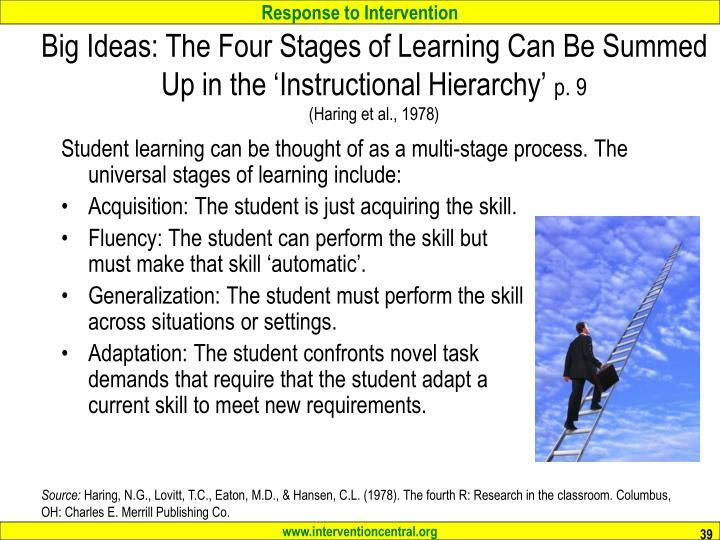 Tier I instruction addresses this question: Are strong classroom instructional strategies sufficient to help the student to achieve academic success? 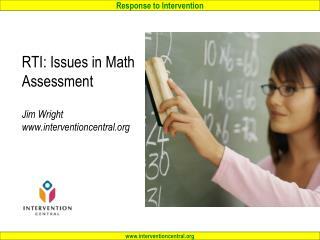 Targets ‘red flag’ students who are not successful with core instruction alone. 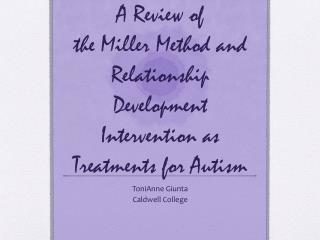 Uses ‘evidence-based’ strategies to address student academic or behavioral concerns. Must be feasible to implement given the resources available in the classroom. 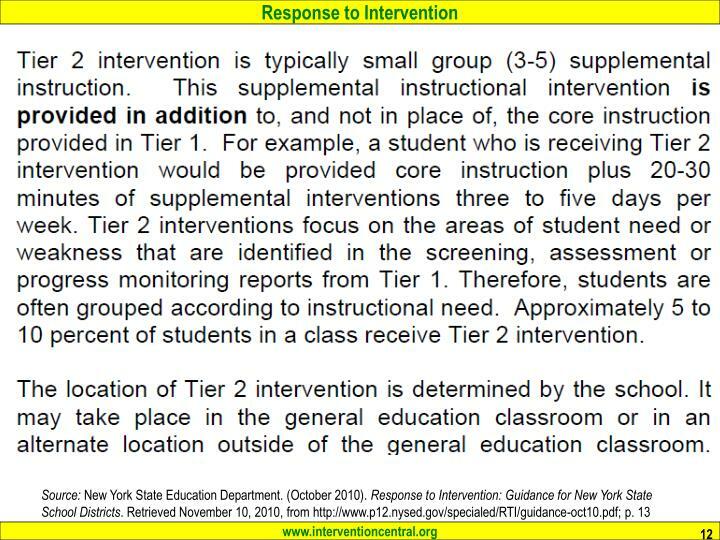 Tier I intervention addresses the question: Does the student make adequate progress when the instructor uses specific academic or behavioral strategies matched to the presenting concern? 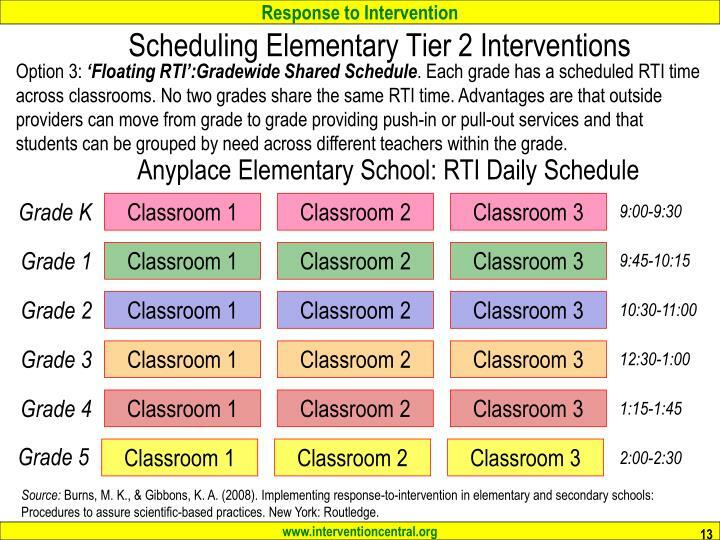 Option 3: ‘Floating RTI’:Gradewide Shared Schedule. Each grade has a scheduled RTI time across classrooms. No two grades share the same RTI time. Advantages are that outside providers can move from grade to grade providing push-in or pull-out services and that students can be grouped by need across different teachers within the grade. Source: Burns, M. K., & Gibbons, K. A. (2008). 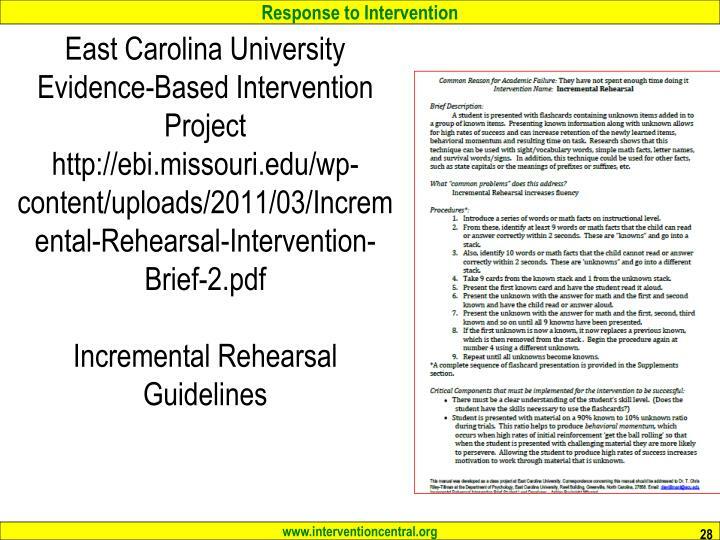 Implementing response-to-intervention in elementary and secondary schools: Procedures to assure scientific-based practices. New York: Routledge. 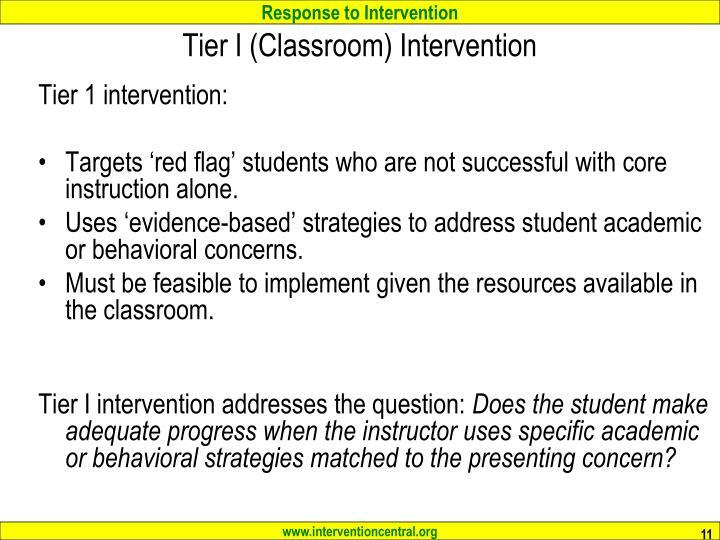 Tier 3: Intensive interventions. 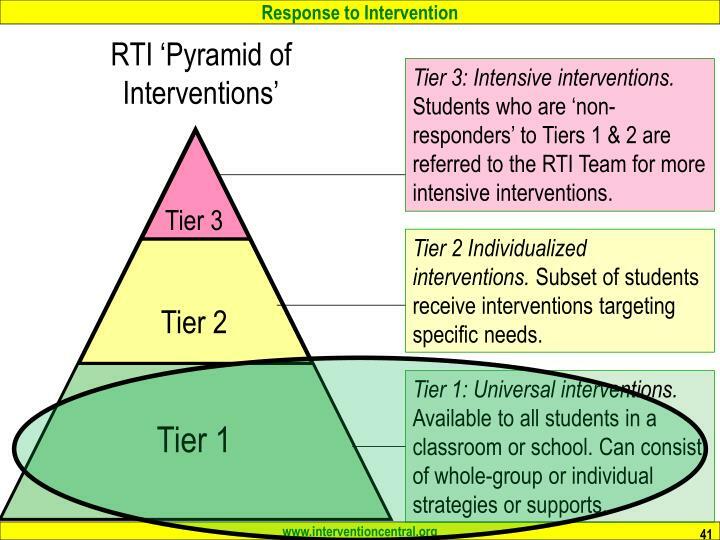 Students who are ‘non-responders’ to Tiers 1 & 2 are referred to the RTI Team for more intensive interventions. 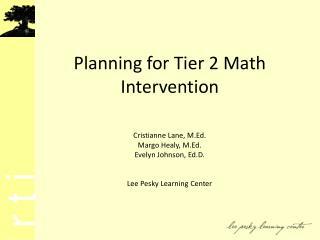 Tier 2 Individualized interventions. 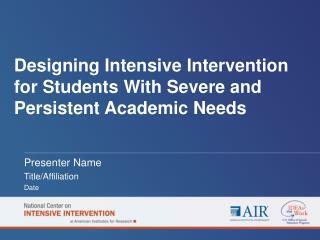 Subset of students receive interventions targeting specific needs. 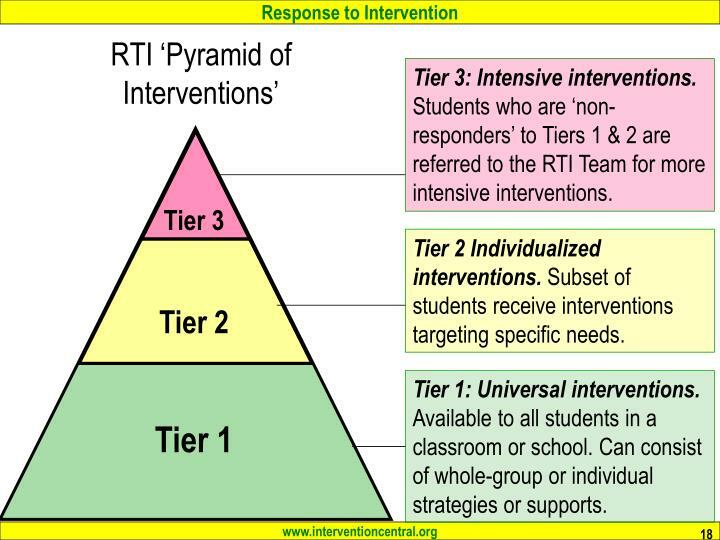 Tier 1: Universal interventions. Available to all students in a classroom or school. 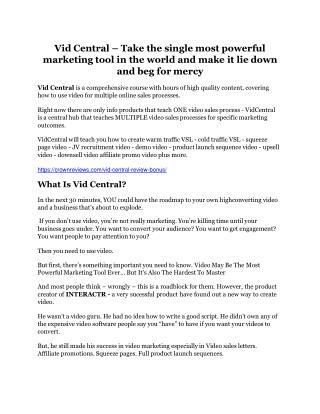 Can consist of whole-group or individual strategies or supports. 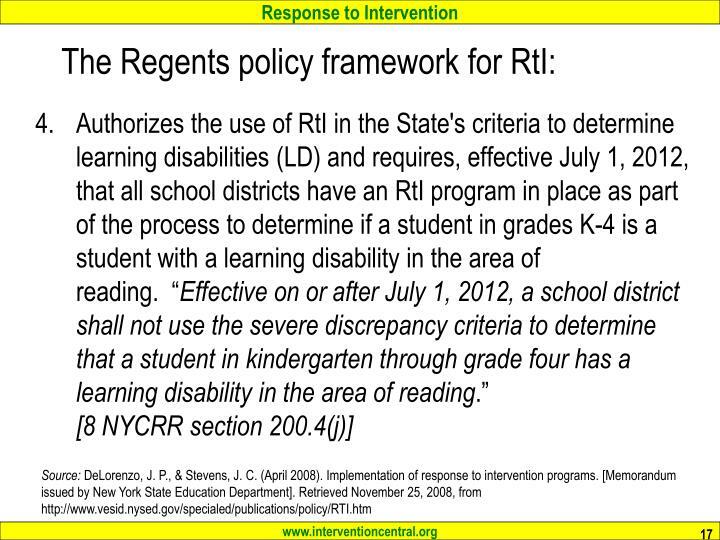 What previous approach to diagnosing Learning Disabilities does RTI replace? 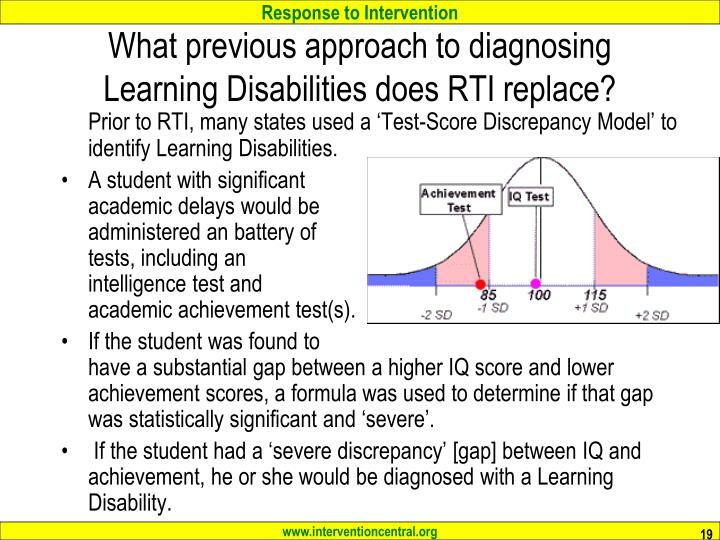 Prior to RTI, many states used a ‘Test-Score Discrepancy Model’ to identify Learning Disabilities. A student with significant academic delays would be administered an battery of tests, including an intelligence test and academic achievement test(s). If the student was found to have a substantial gap between a higher IQ score and lower achievement scores, a formula was used to determine if that gap was statistically significant and ‘severe’. 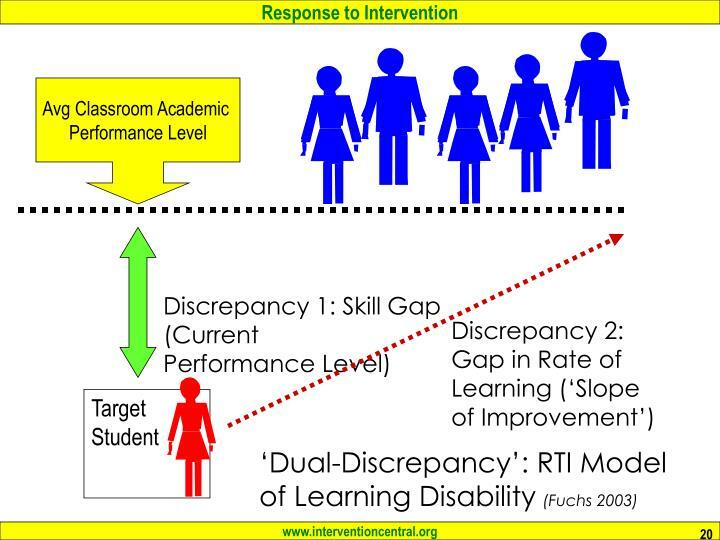 If the student had a ‘severe discrepancy’ [gap] between IQ and achievement, he or she would be diagnosed with a Learning Disability. 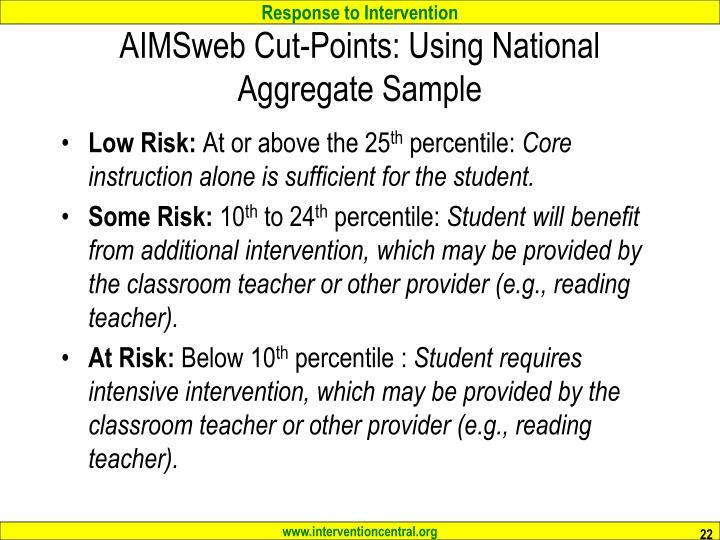 Low Risk: At or above the 25th percentile: Core instruction alone is sufficient for the student. 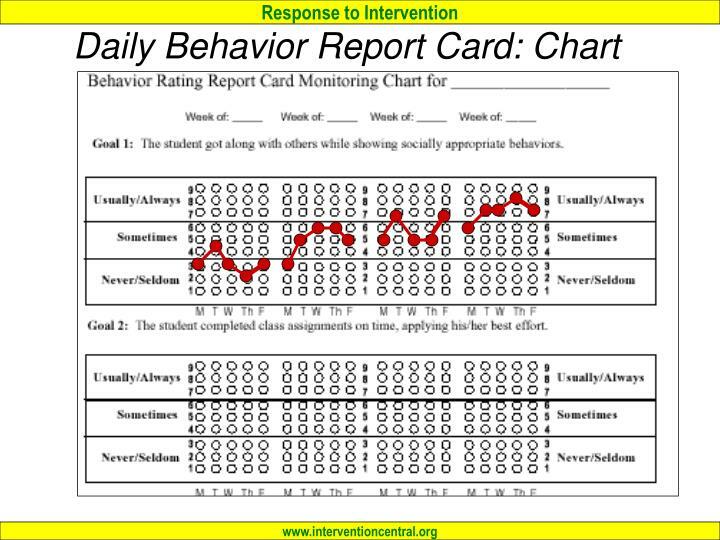 Some Risk: 10th to 24th percentile: Student will benefit from additional intervention, which may be provided by the classroom teacher or other provider (e.g., reading teacher). 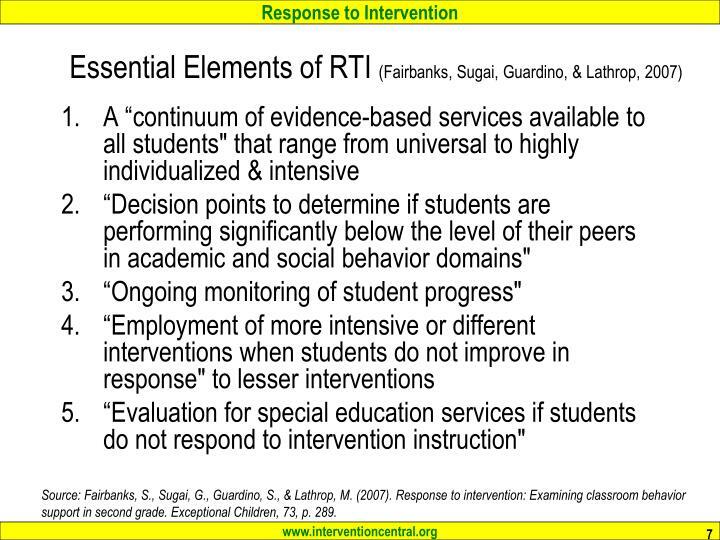 At Risk: Below 10th percentile : Student requires intensive intervention, which may be provided by the classroom teacher or other provider (e.g., reading teacher). 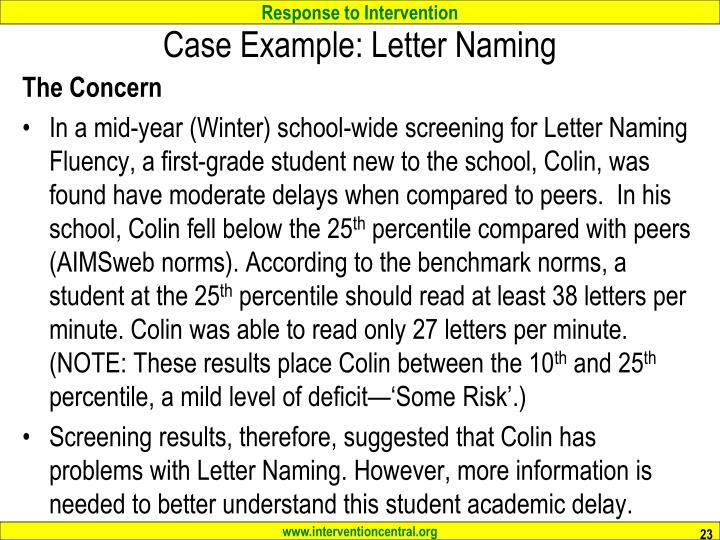 Screening results, therefore, suggested that Colin has problems with Letter Naming. However, more information is needed to better understand this student academic delay. Based on her findings, Ms. Tessia decided that Colin was still acquiring skill at letter names. He needed direct-teaching activities to learn to identify all of the letters. 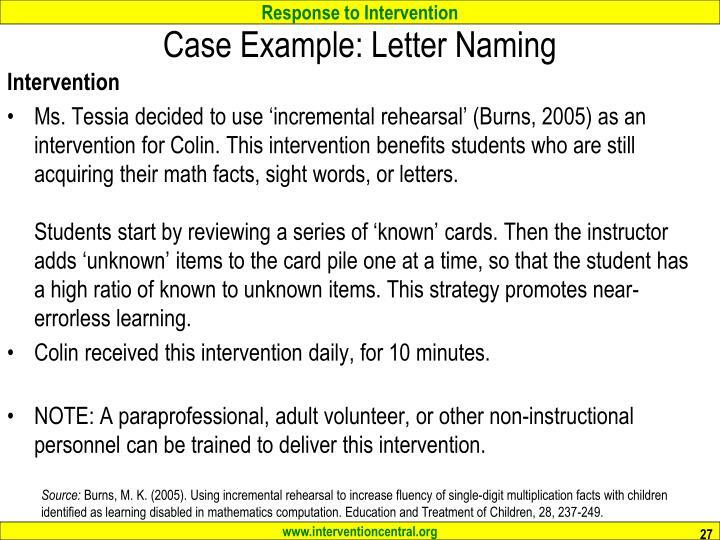 Ms. Tessia decided to use ‘incremental rehearsal’ (Burns, 2005) as an intervention for Colin. 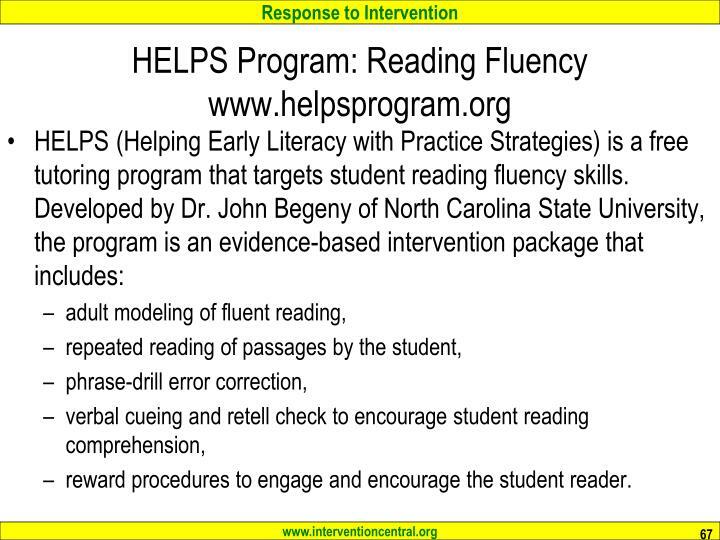 This intervention benefits students who are still acquiring their math facts, sight words, or letters. Students start by reviewing a series of ‘known’ cards. Then the instructor adds ‘unknown’ items to the card pile one at a time, so that the student has a high ratio of known to unknown items. This strategy promotes near-errorless learning. 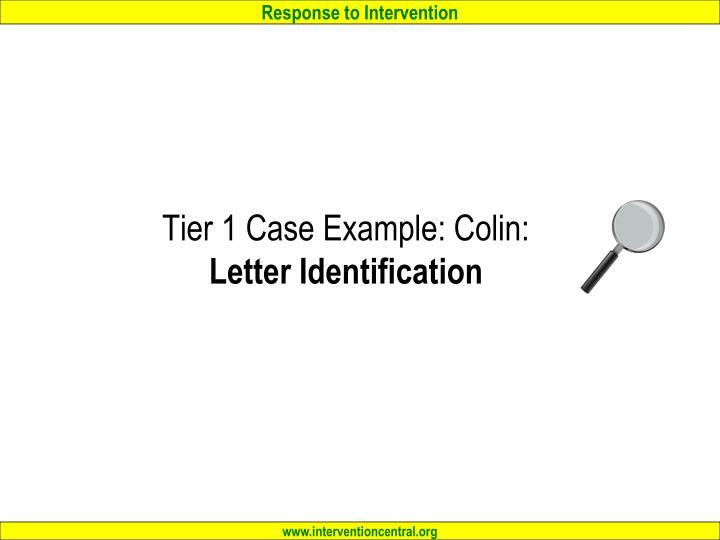 Colin received this intervention daily, for 10 minutes. 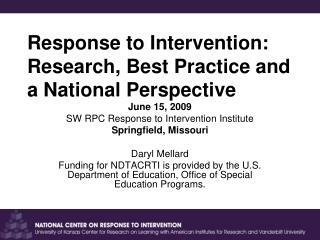 NOTE: A paraprofessional, adult volunteer, or other non-instructional personnel can be trained to deliver this intervention. Source: Burns, M. K. (2005). Using incremental rehearsal to increase fluency of single-digit multiplication facts with children identified as learning disabled in mathematics computation. 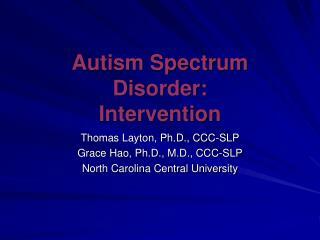 Education and Treatment of Children, 28, 237-249.
identify all upper-case and lower-case letters. 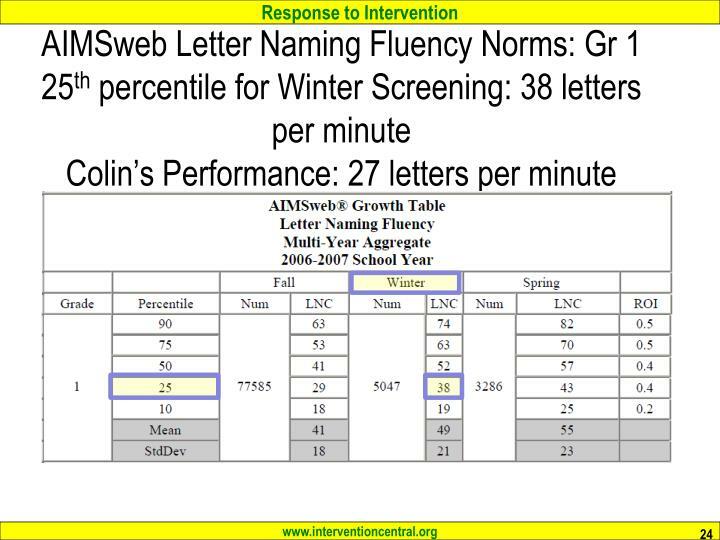 move above the 25th percentile in Letter Naming Fluency when compared to grade-level peers (using the AIMSweb norms). At the end of each tutoring session, the tutor logged any additional formerly unknown letters that were now ‘known’ (that the student could now accurately identify within 3 seconds). Each week, the teacher administered a one-minute timed Letter Naming Fluency probe and charted the number of correctly identified letters. 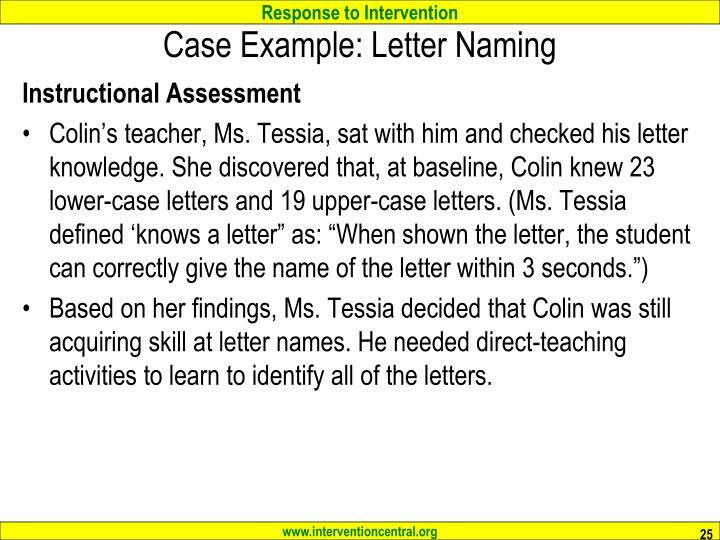 Ms. Tessia discovered that Colin attained the first goal (‘able to identify all upper-case and lower-case letters’) within 2 weeks. Colin attained the second goal (‘move above the 25th percentile in Letter Naming Fluency when compared to grade-level peers’ by reading at least 38 letters per minute) within the expected four instructional weeks. 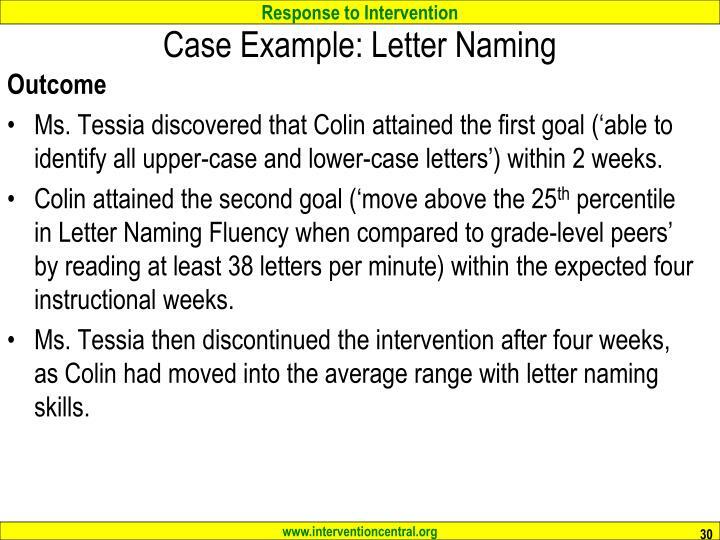 Ms. Tessia then discontinued the intervention after four weeks, as Colin had moved into the average range with letter naming skills. 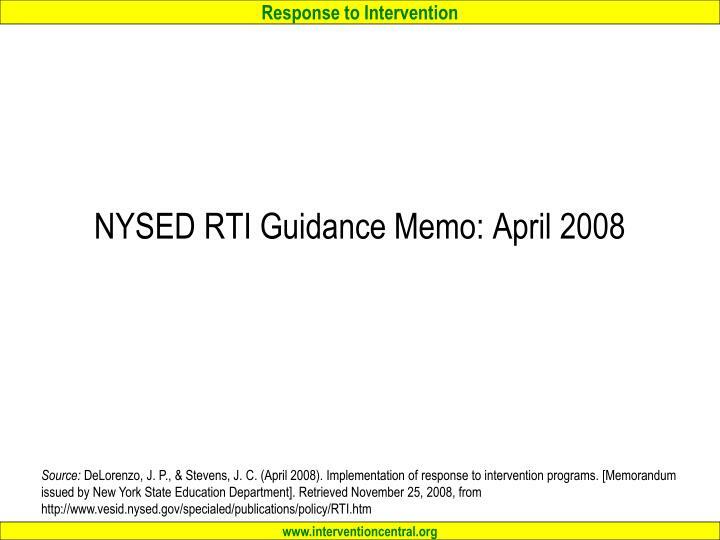 RTI: What Are Your Questions? 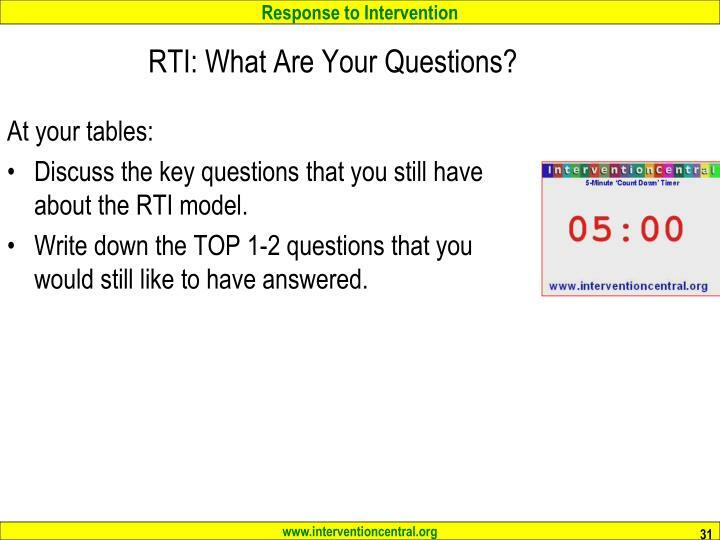 Discuss the key questions that you still have about the RTI model. Write down the TOP 1-2 questions that you would still like to have answered. 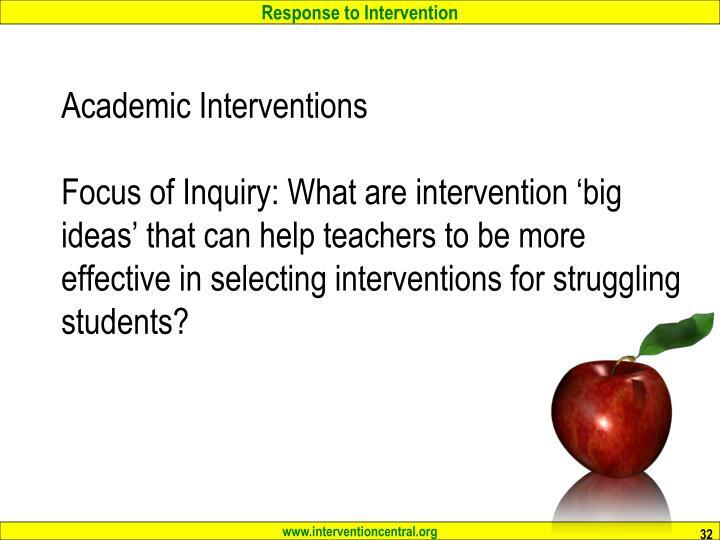 Academic InterventionsFocus of Inquiry: What are intervention ‘big ideas’ that can help teachers to be more effective in selecting interventions for struggling students? Core Instruction. 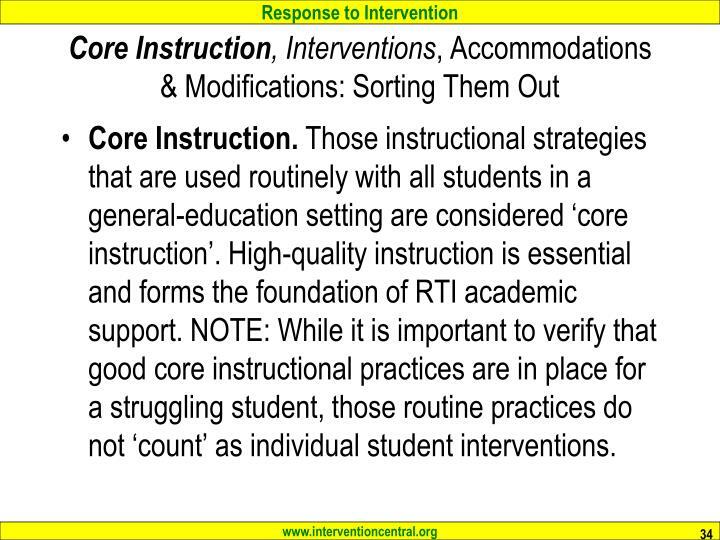 Those instructional strategies that are used routinely with all students in a general-education setting are considered ‘core instruction’. High-quality instruction is essential and forms the foundation of RTI academic support. 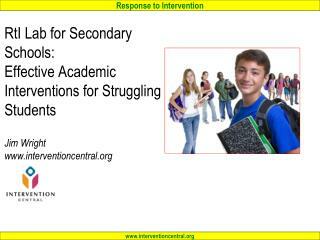 NOTE: While it is important to verify that good core instructional practices are in place for a struggling student, those routine practices do not ‘count’ as individual student interventions. 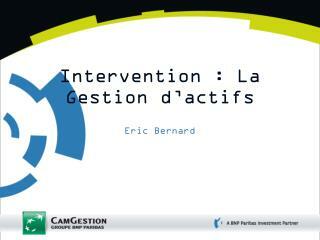 Intervention. 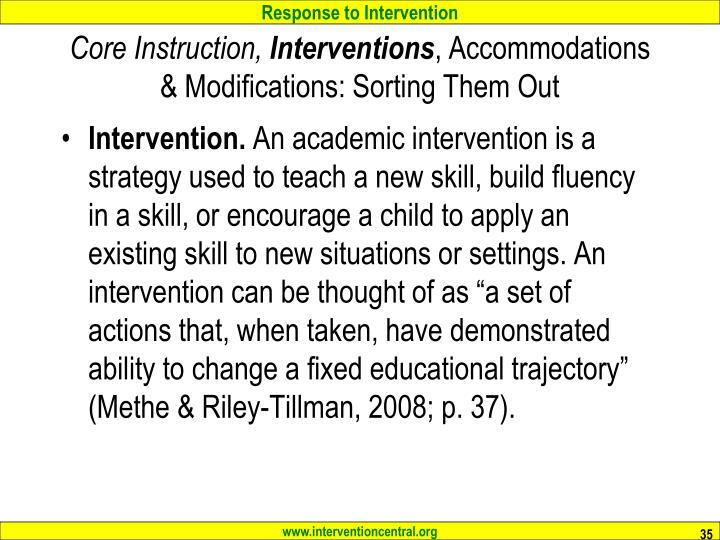 An academic intervention is a strategy used to teach a new skill, build fluency in a skill, or encourage a child to apply an existing skill to new situations or settings. 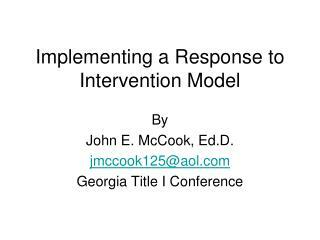 An intervention can be thought of as “a set of actions that, when taken, have demonstrated ability to change a fixed educational trajectory” (Methe & Riley-Tillman, 2008; p. 37). Accommodation. 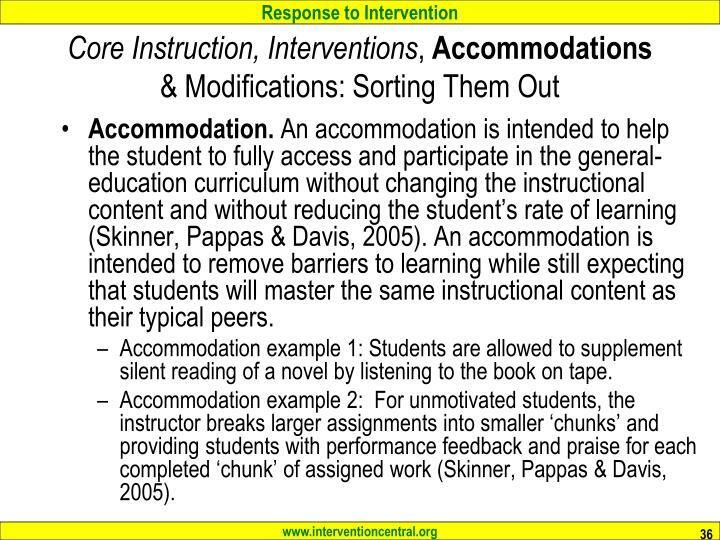 An accommodation is intended to help the student to fully access and participate in the general-education curriculum without changing the instructional content and without reducing the student’s rate of learning (Skinner, Pappas & Davis, 2005). An accommodation is intended to remove barriers to learning while still expecting that students will master the same instructional content as their typical peers. Accommodation example 1: Students are allowed to supplement silent reading of a novel by listening to the book on tape. Accommodation example 2: For unmotivated students, the instructor breaks larger assignments into smaller ‘chunks’ and providing students with performance feedback and praise for each completed ‘chunk’ of assigned work (Skinner, Pappas & Davis, 2005). 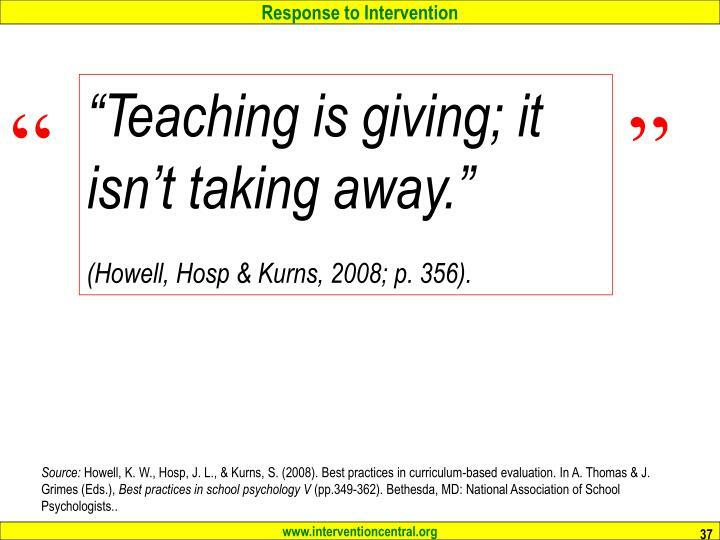 “Teaching is giving; it isn’t taking away.” (Howell, Hosp & Kurns, 2008; p. 356). 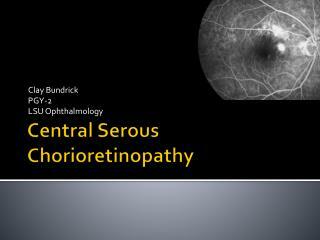 Source: Howell, K. W., Hosp, J. L., & Kurns, S. (2008). Best practices in curriculum-based evaluation. In A. Thomas & J. Grimes (Eds. ), Best practices in school psychology V (pp.349-362). Bethesda, MD: National Association of School Psychologists..
Acquisition: The student is just acquiring the skill. Fluency: The student can perform the skill but must make that skill ‘automatic’. Generalization: The student must perform the skill across situations or settings. Adaptation: The student confronts novel task demands that require that the student adapt a current skill to meet new requirements. Source: Haring, N.G., Lovitt, T.C., Eaton, M.D., & Hansen, C.L. (1978). The fourth R: Research in the classroom. Columbus, OH: Charles E. Merrill Publishing Co. 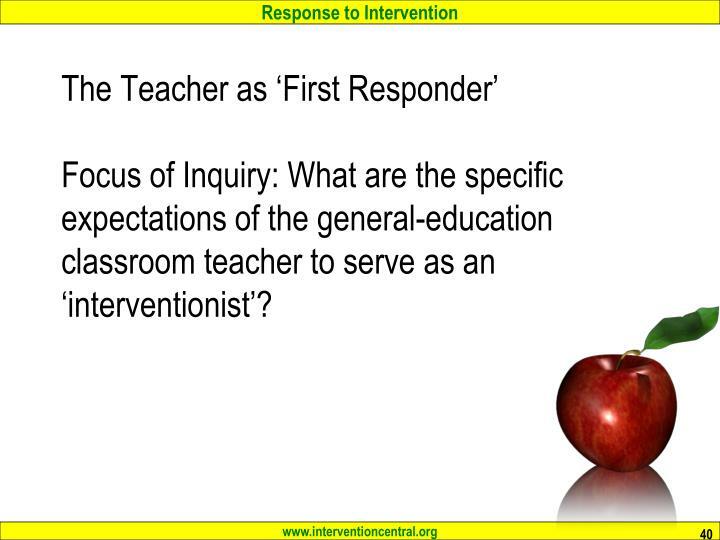 The Teacher as ‘First Responder’Focus of Inquiry: What are the specific expectations of the general-education classroom teacher to serve as an ‘interventionist’? The teacher defines the student academic or behavioral problem clearly. The teacher decides on the best explanation for why the problem is occurring. 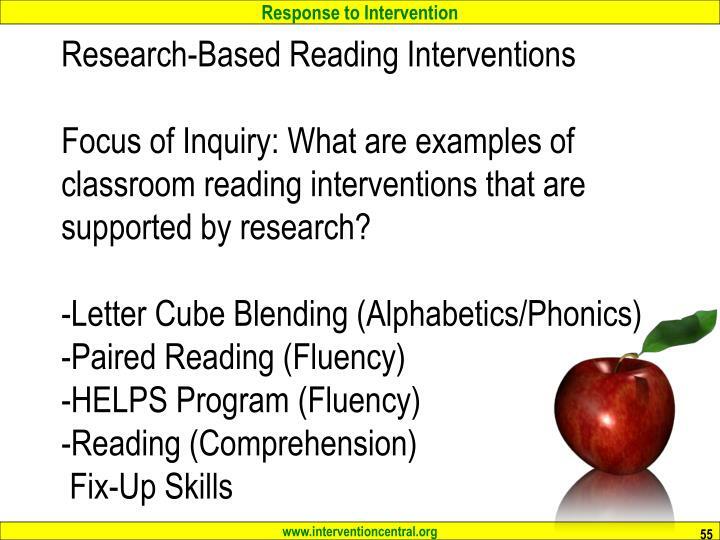 The teacher selects ‘research-based’ interventions. 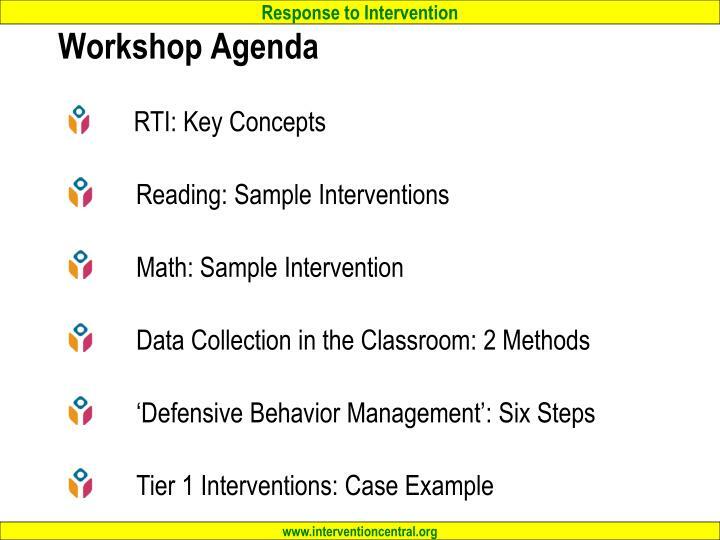 The teacher documents the student’s Tier 1 intervention plan. 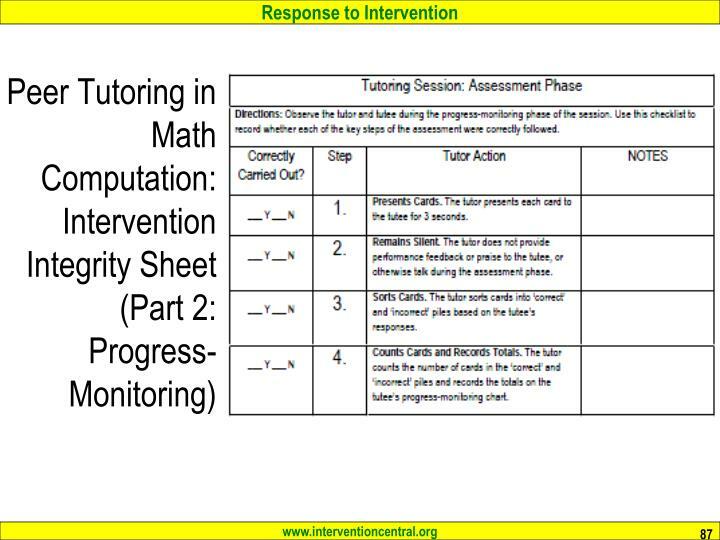 The teacher monitors the student’s response (progress) to the intervention plan. 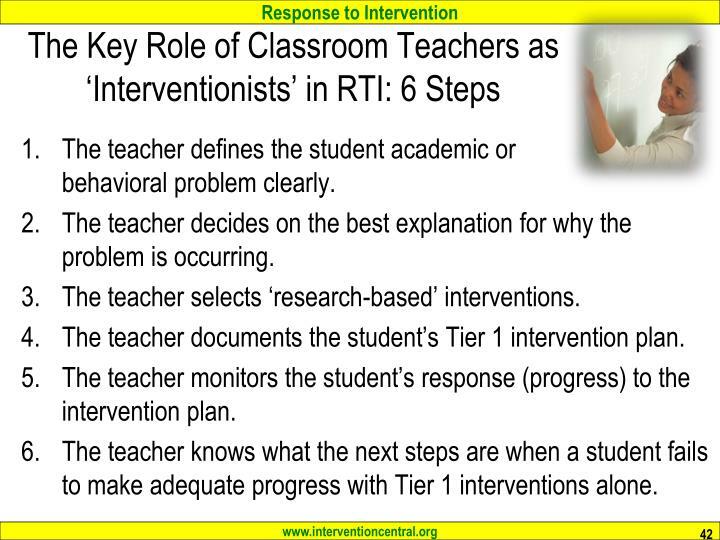 The teacher knows what the next steps are when a student fails to make adequate progress with Tier 1 interventions alone. 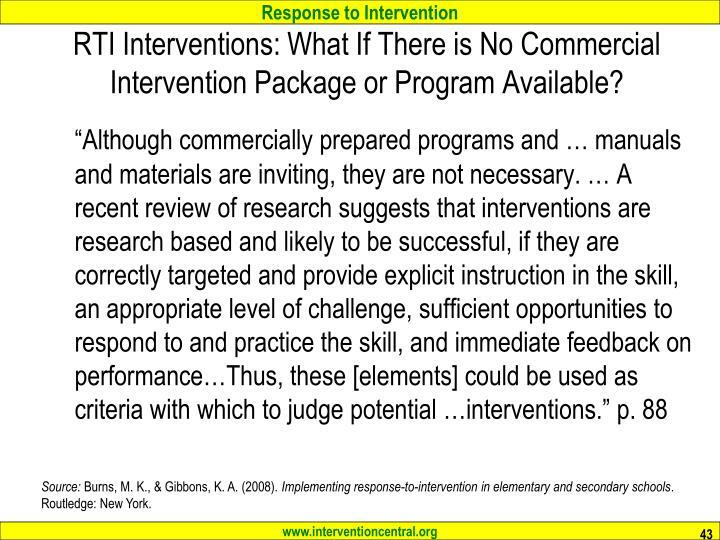 RTI Interventions: What If There is No Commercial Intervention Package or Program Available? Source: Burns, M. K., & Gibbons, K. A. (2008). 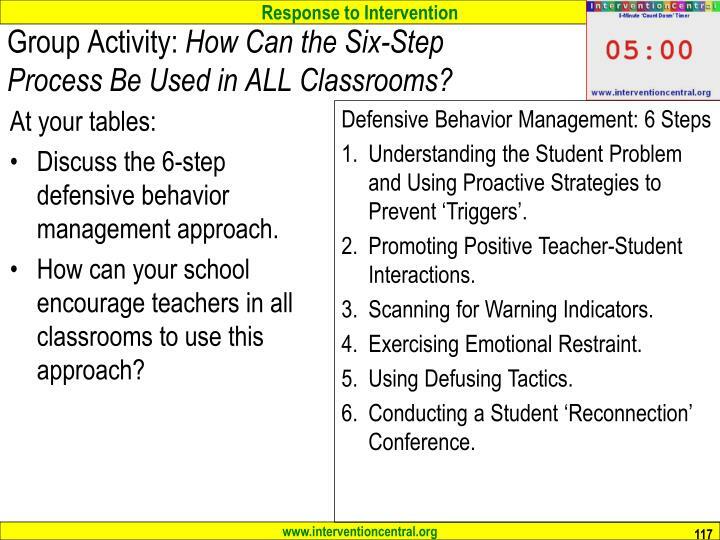 Implementing response-to-intervention in elementary and secondary schools. Routledge: New York. 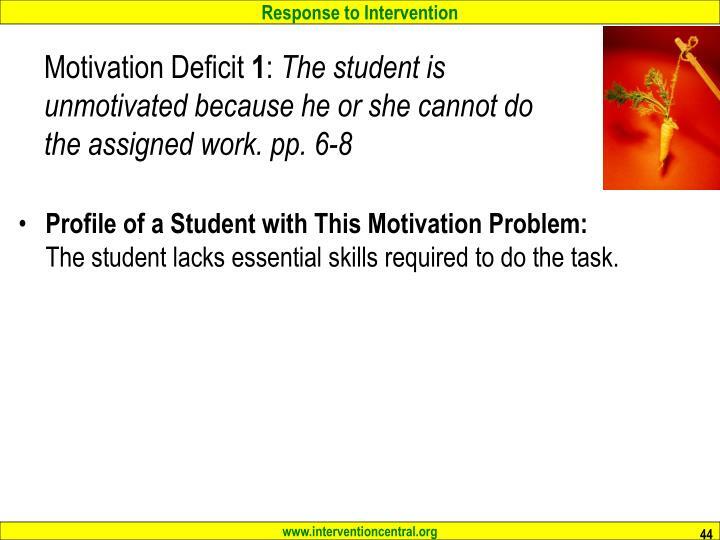 Profile of a Student with This Motivation Problem:The student lacks essential skills required to do the task. Basic academic skills. Basic skills have straightforward criteria for correct performance (e.g., the student defines vocabulary words or decodes text or computes ‘math facts’) and comprise the building-blocks of more complex academic tasks (Rupley, Blair, & Nichols, 2009). Cognitive strategies. 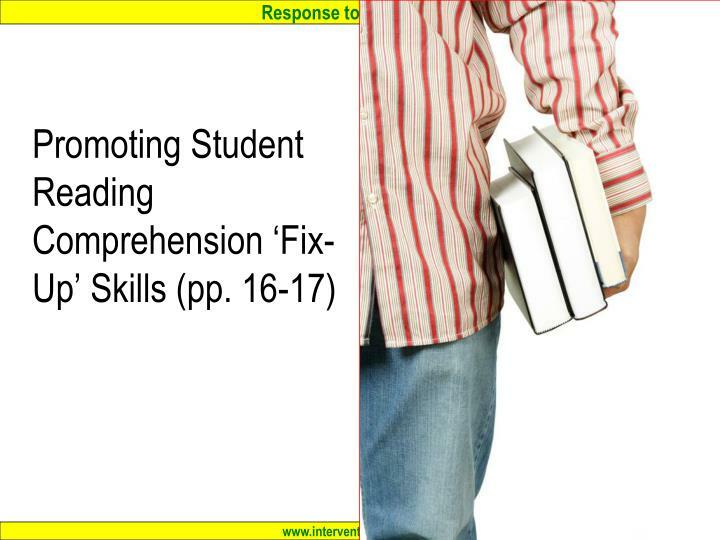 Students employ specific cognitive strategies as “guiding procedures” to complete more complex academic tasks such as reading comprehension or writing (Rosenshine, 1995). Academic-enabling skills. 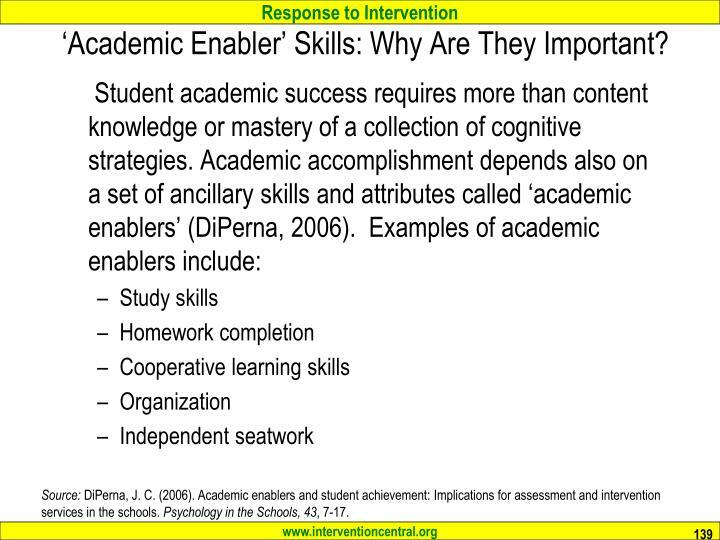 Skills that are ‘academic enablers’ (DiPerna, 2006) are not tied to specific academic knowledge but rather aid student learning across a wide range of settings and tasks (e.g., organizing work materials, time management). 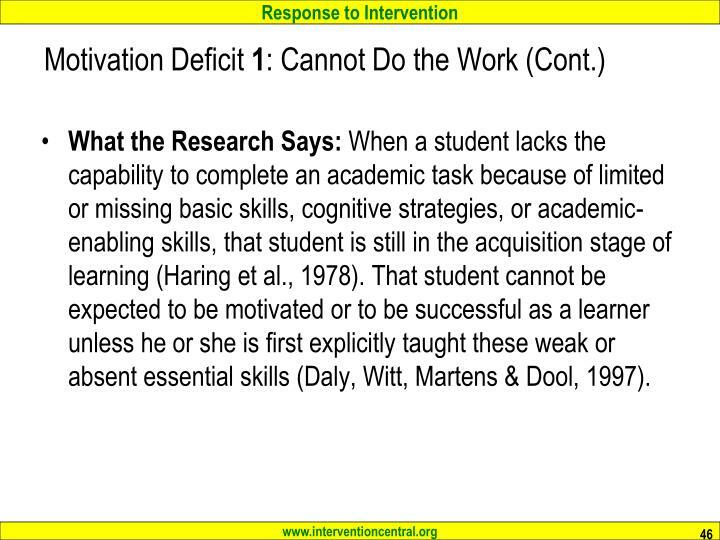 What the Research Says: When a student lacks the capability to complete an academic task because of limited or missing basic skills, cognitive strategies, or academic-enabling skills, that student is still in the acquisition stage of learning (Haring et al., 1978). 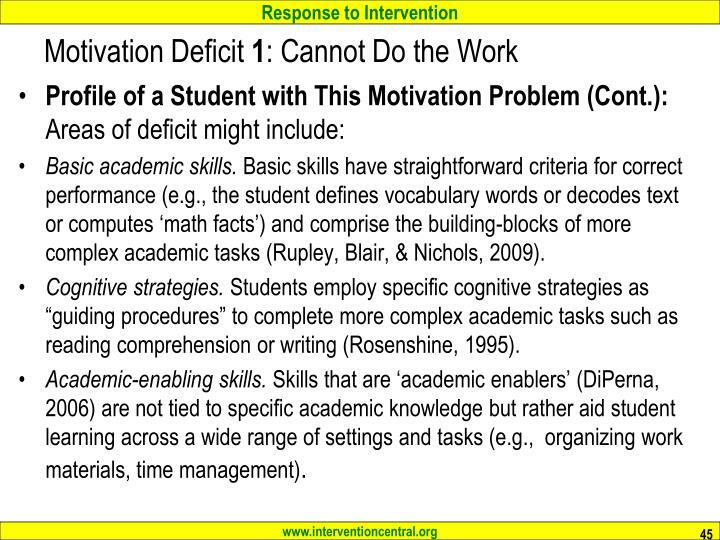 That student cannot be expected to be motivated or to be successful as a learner unless he or she is first explicitly taught these weak or absent essential skills (Daly, Witt, Martens & Dool, 1997). 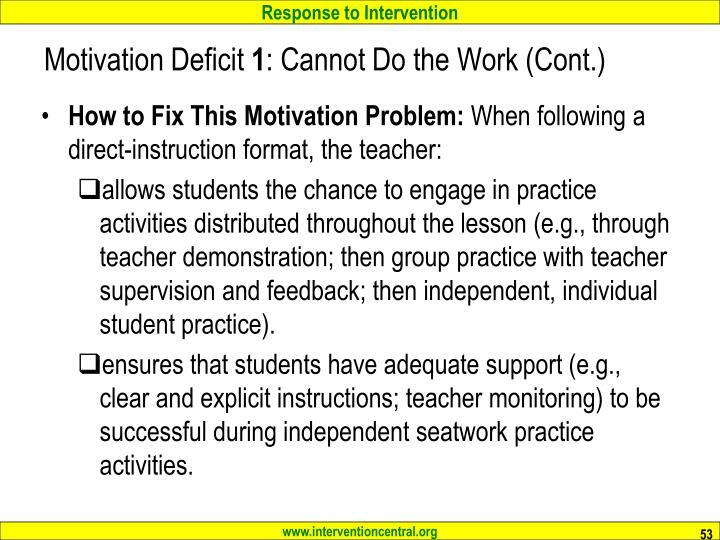 How to Verify the Presence of This Motivation Problem: The teacher collects information (e.g., through observations of the student engaging in academic tasks; interviews with the student; examination of work products, quizzes, or tests) demonstrating that the student lacks basic skills, cognitive strategies, or academic-enabling skills essential to the academic task. 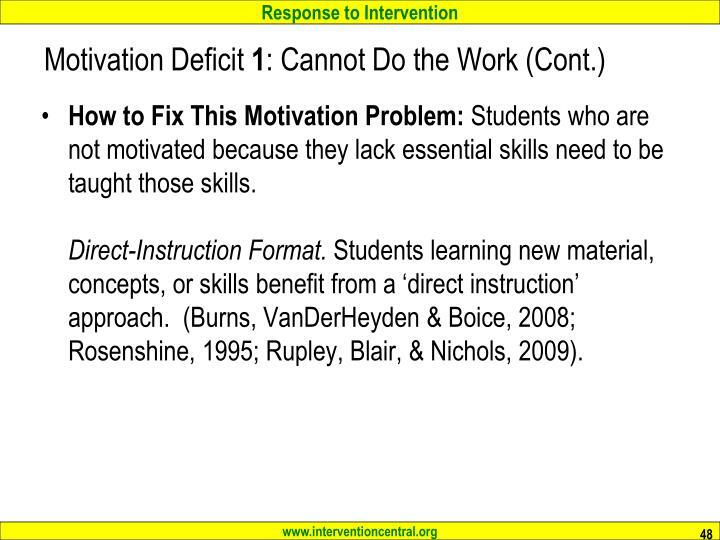 How to Fix This Motivation Problem: Students who are not motivated because they lack essential skills need to be taught those skills. 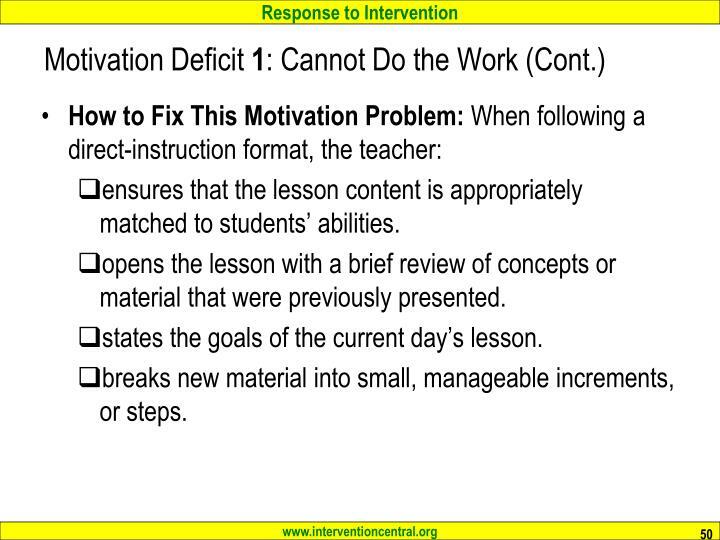 Direct-Instruction Format.Students learning new material, concepts, or skills benefit from a ‘direct instruction’ approach. (Burns, VanDerHeyden & Boice, 2008; Rosenshine, 1995; Rupley, Blair, & Nichols, 2009). ensures that the lesson content is appropriately matched to students’ abilities. opens the lesson with a brief review of concepts or material that were previously presented. states the goals of the current day’s lesson. breaks new material into small, manageable increments, or steps. throughout the lesson, provides adequate explanations and detailed instructions for all concepts and materials being taught. 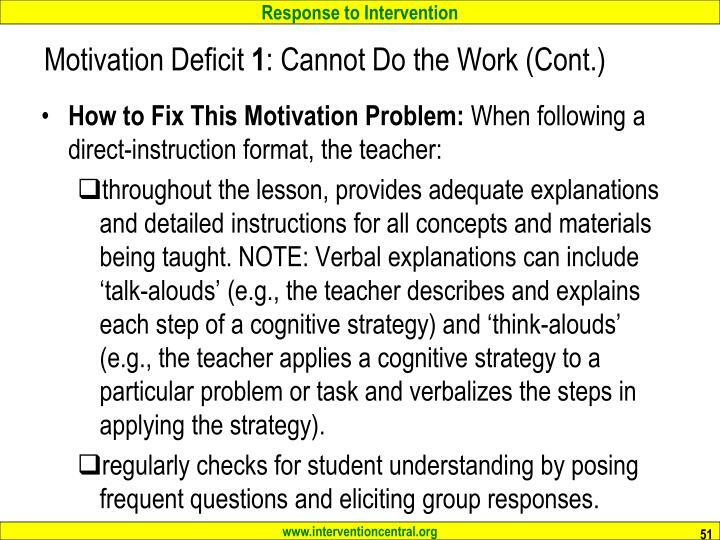 NOTE: Verbal explanations can include ‘talk-alouds’ (e.g., the teacher describes and explains each step of a cognitive strategy) and ‘think-alouds’ (e.g., the teacher applies a cognitive strategy to a particular problem or task and verbalizes the steps in applying the strategy). regularly checks for student understanding by posing frequent questions and eliciting group responses. verifies that students are experiencing sufficient success in the lesson content to shape their learning in the desired direction and to maintain student motivation and engagement. provides timely and regular performance feedback and corrections throughout the lesson as needed to guide student learning. allows students the chance to engage in practice activities distributed throughout the lesson (e.g., through teacher demonstration; then group practice with teacher supervision and feedback; then independent, individual student practice). ensures that students have adequate support (e.g., clear and explicit instructions; teacher monitoring) to be successful during independent seatwork practice activities. 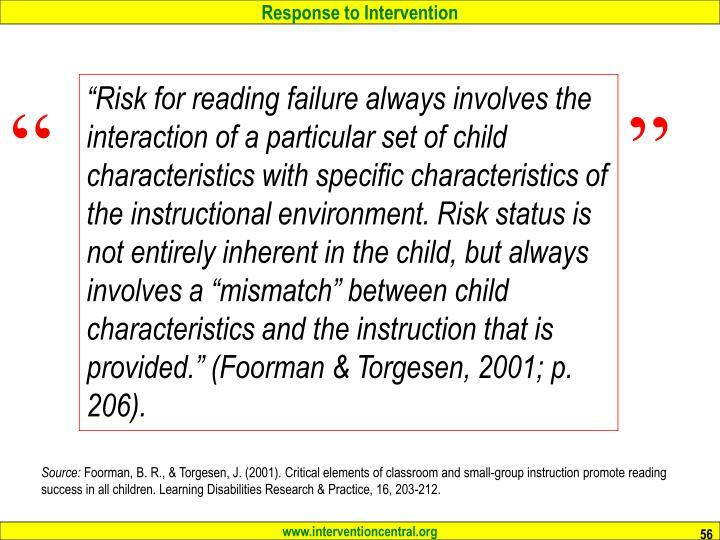 “Risk for reading failure always involves the interaction of a particular set of child characteristics with specific characteristics of the instructional environment. Risk status is not entirely inherent in the child, but always involves a “mismatch” between child characteristics and the instruction that is provided.” (Foorman & Torgesen, 2001; p. 206). Source: Foorman, B. R., & Torgesen, J. (2001). 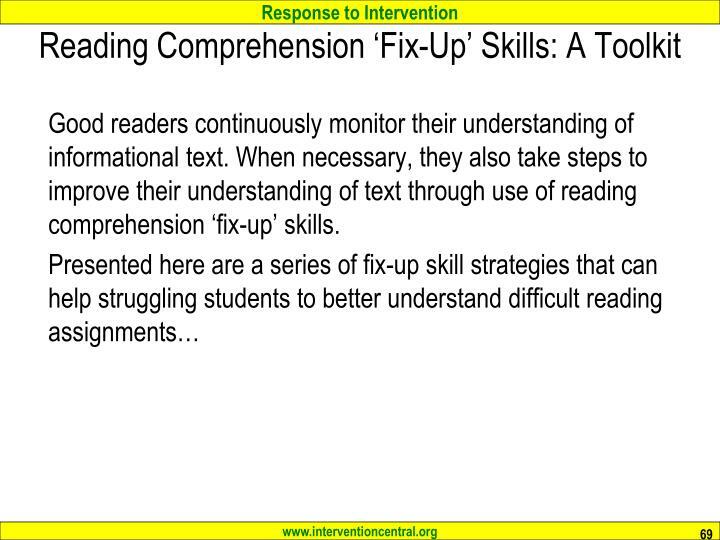 Critical elements of classroom and small-group instruction promote reading success in all children. 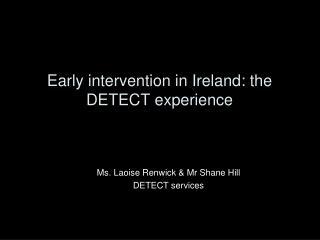 Learning Disabilities Research & Practice, 16, 203-212. 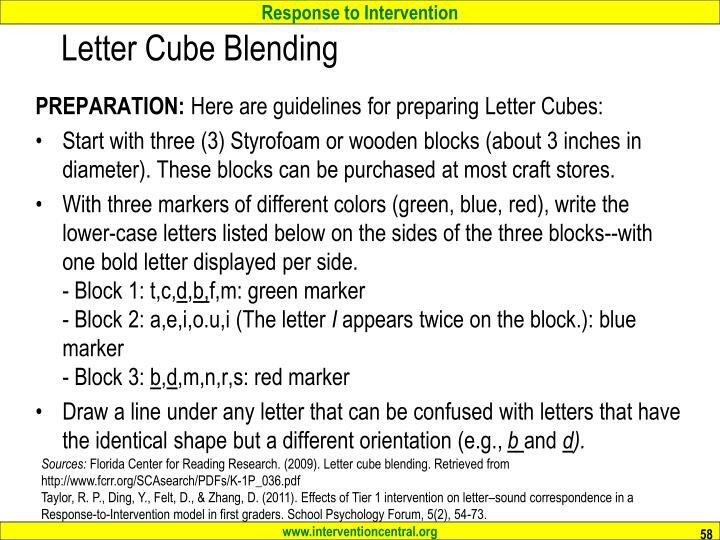 The Letter Cube Blending intervention targets alphabetic (phonics) skills. The student is given three cubes with assorted consonants and vowels appearing on their sides. The student rolls the cubes and records the resulting letter combinations on a recording sheet. The student then judges whether each resulting ‘word’ composed from the letters randomly appearing on the blocks is a real word or a nonsense word. 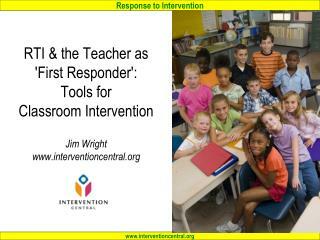 The intervention can be used with one student or a group. 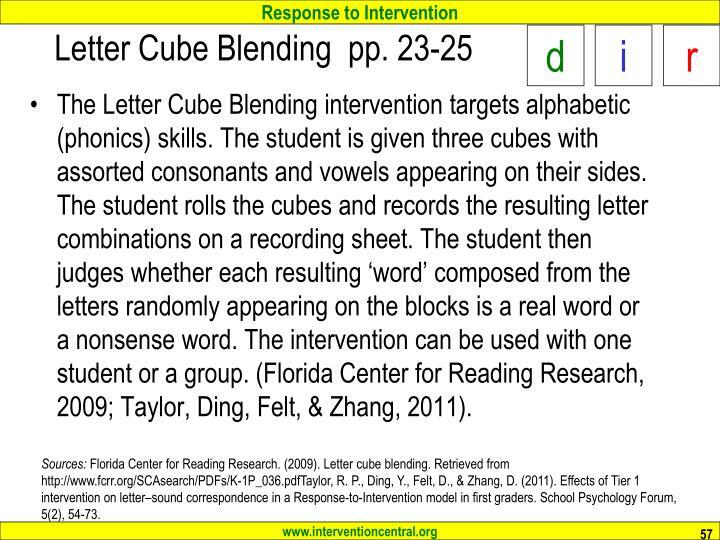 (Florida Center for Reading Research, 2009; Taylor, Ding, Felt, & Zhang, 2011). Sources: Florida Center for Reading Research. (2009). Letter cube blending. Retrieved from http://www.fcrr.org/SCAsearch/PDFs/K-1P_036.pdfTaylor, R. P., Ding, Y., Felt, D., & Zhang, D. (2011). 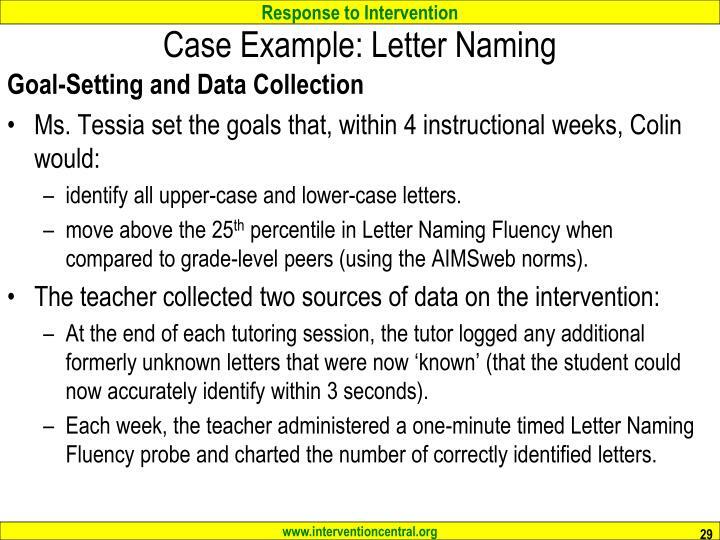 Effects of Tier 1 intervention on letter–sound correspondence in a Response-to-Intervention model in first graders. School Psychology Forum, 5(2), 54-73. Start with three (3) Styrofoam or wooden blocks (about 3 inches in diameter). These blocks can be purchased at most craft stores. Draw a line under any letter that can be confused with letters that have the identical shape but a different orientation (e.g., b andd). Each student takes a turn rolling the Letter Cubes. The student tosses the cubes on the floor, a table, or other flat, unobstructed surface. The cubes are then lined up in 1-2-3 (green: blue: red) order. 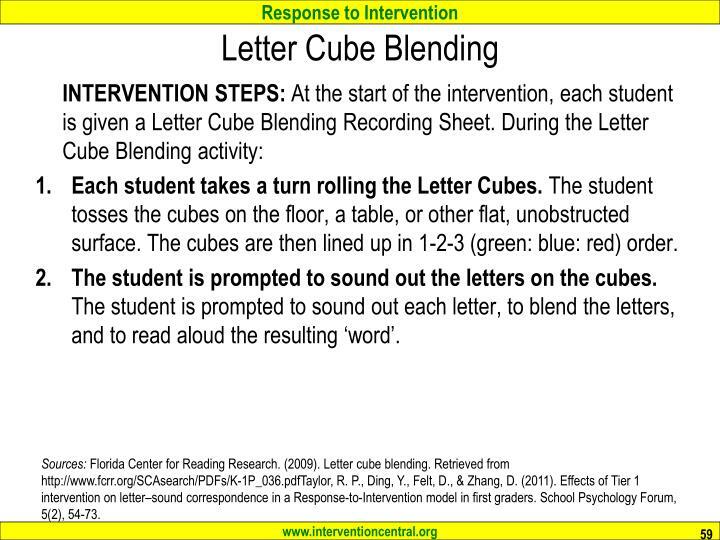 The student is prompted to sound out the letters on the cubes. The student is prompted to sound out each letter, to blend the letters, and to read aloud the resulting ‘word’. The student identifies and records the word as ‘real’ or ‘nonsense’. 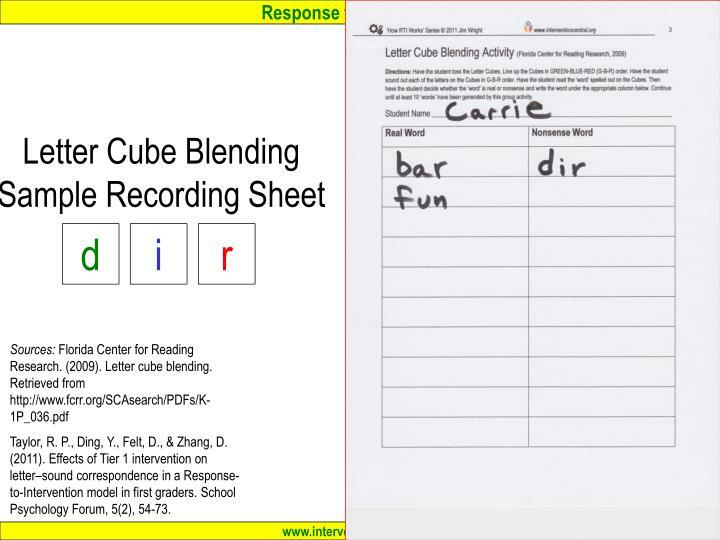 The student then identifies the word as ‘real’ or ‘nonsense’ and then writes the word on in the appropriate column on the Letter Cube Blending Recording Sheet. The activity continues to 10 words. The activity continues until students in the group have generated at least 10 words on their recording sheets. Taylor, R. P., Ding, Y., Felt, D., & Zhang, D. (2011). 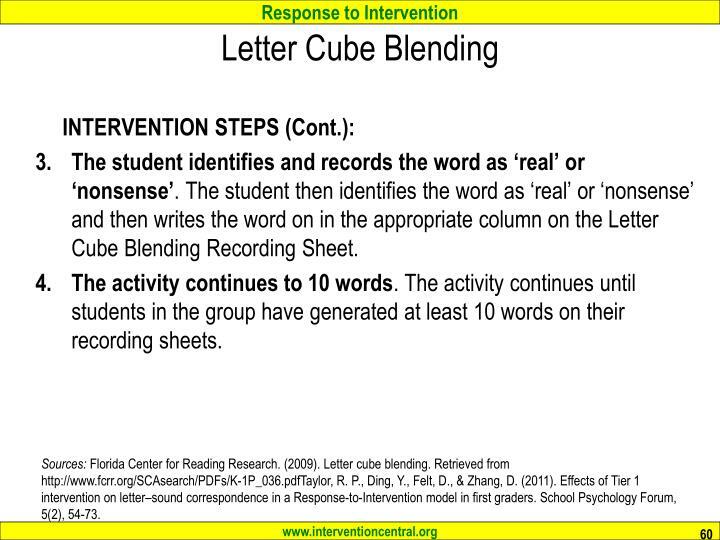 Effects of Tier 1 intervention on letter–sound correspondence in a Response-to-Intervention model in first graders. School Psychology Forum, 5(2), 54-73. The student reads aloud in tandem with an accomplished reader. 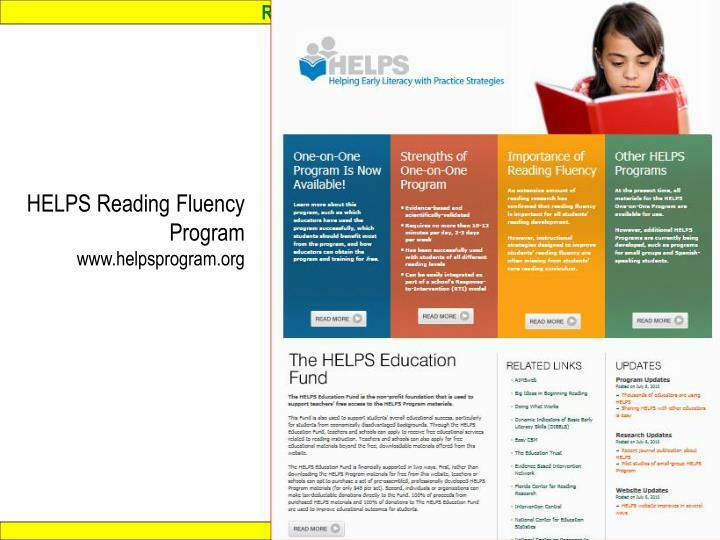 At a student signal, the helping reader stops reading, while the student continues on. 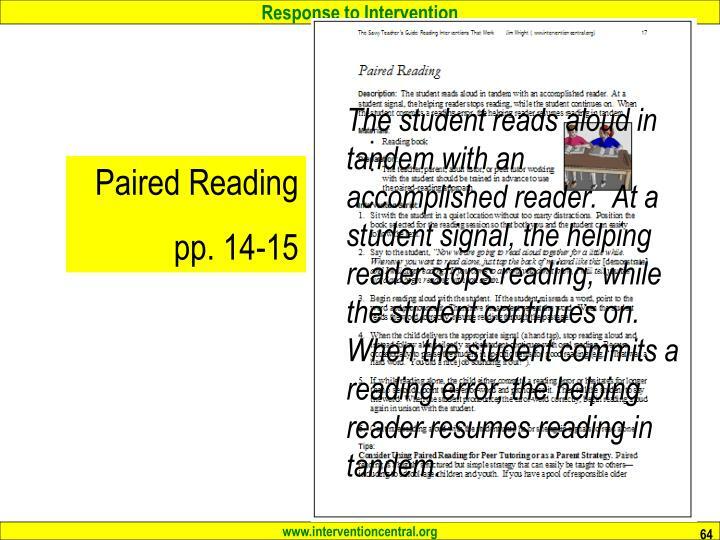 When the student commits a reading error, the helping reader resumes reading in tandem. reward procedures to engage and encourage the student reader. Good readers continuously monitor their understanding of informational text. 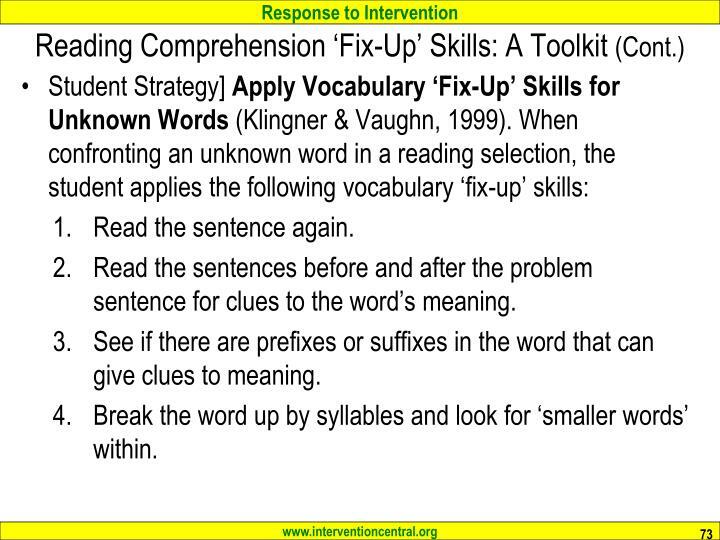 When necessary, they also take steps to improve their understanding of text through use of reading comprehension ‘fix-up’ skills. 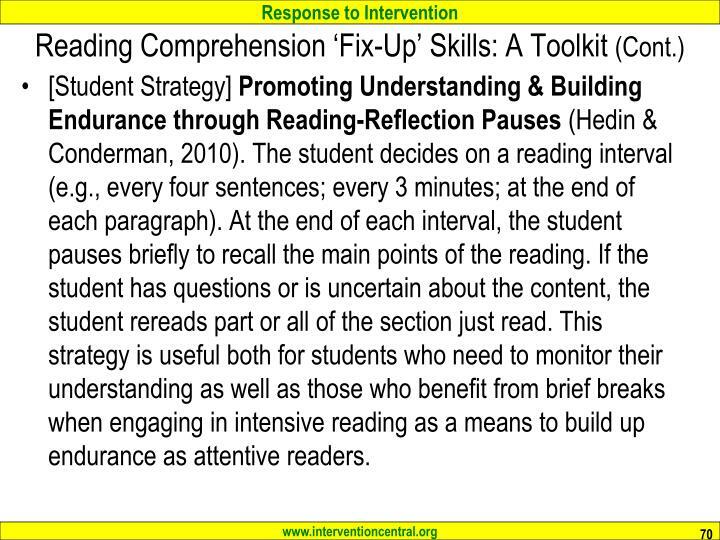 [Student Strategy] Promoting Understanding & Building Endurance throughReading-Reflection Pauses (Hedin & Conderman, 2010).The student decides on a reading interval (e.g., every four sentences; every 3 minutes; at the end of each paragraph). At the end of each interval, the student pauses briefly to recall the main points of the reading. If the student has questions or is uncertain about the content, the student rereads part or all of the section just read. 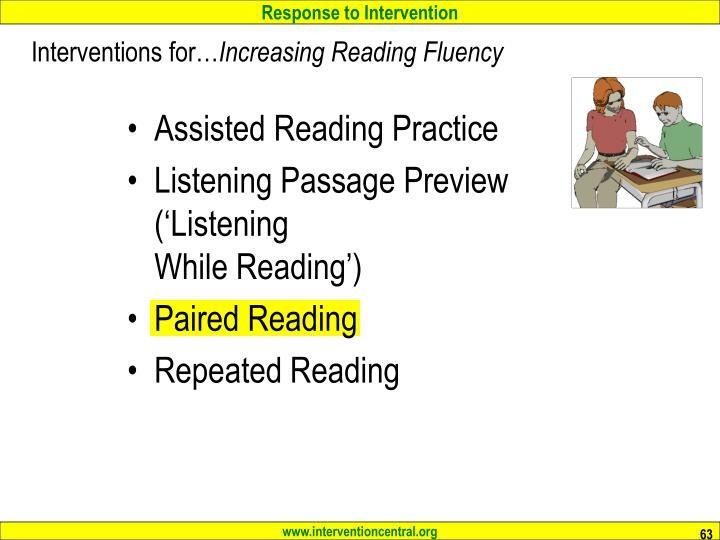 This strategy is useful both for students who need to monitor their understanding as well as those who benefit from brief breaks when engaging in intensive reading as a means to build up endurance as attentive readers. 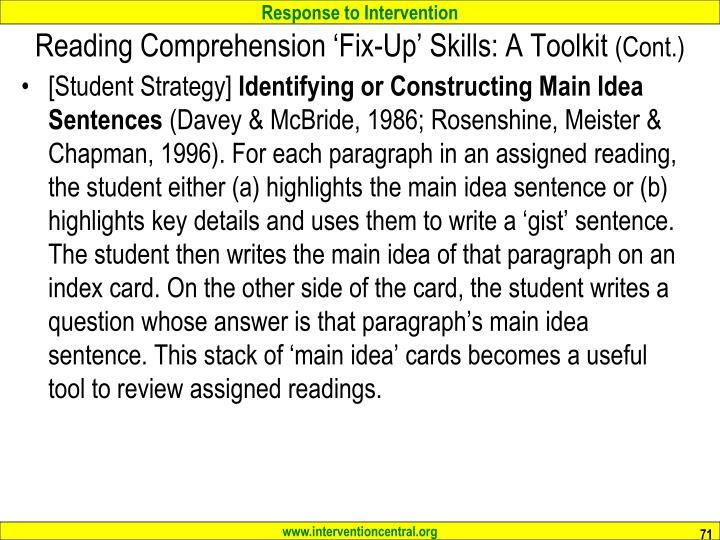 [Student Strategy] Identifying or Constructing Main Idea Sentences (Davey & McBride, 1986; Rosenshine, Meister & Chapman, 1996).For each paragraph in an assigned reading, the student either (a) highlights the main idea sentence or (b) highlights key details and uses them to write a ‘gist’ sentence. The student then writes the main idea of that paragraph on an index card. On the other side of the card, the student writes a question whose answer is that paragraph’s main idea sentence. This stack of ‘main idea’ cards becomes a useful tool to review assigned readings. 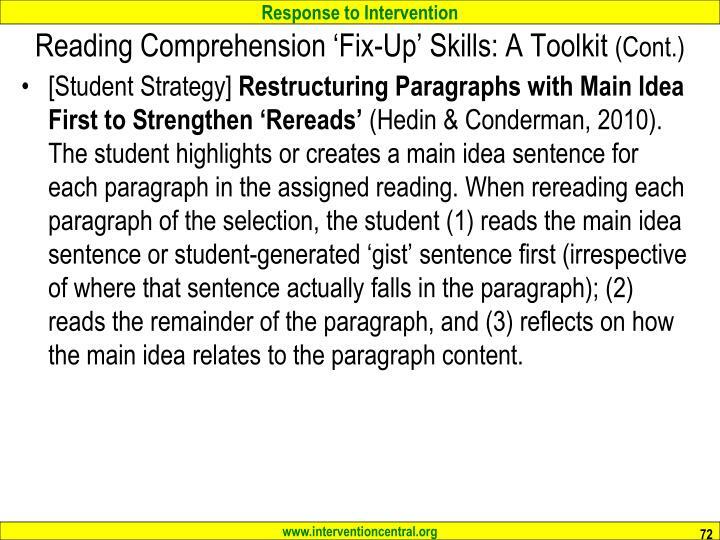 [Student Strategy] Restructuring Paragraphs with Main Idea First to Strengthen ‘Rereads’ (Hedin & Conderman, 2010). The student highlights or creates a main idea sentence for each paragraph in the assigned reading. When rereading each paragraph of the selection, the student (1) reads the main idea sentence or student-generated ‘gist’ sentence first (irrespective of where that sentence actually falls in the paragraph); (2) reads the remainder of the paragraph, and (3) reflects on how the main idea relates to the paragraph content. Read the sentences before and after the problem sentence for clues to the word’s meaning. See if there are prefixes or suffixes in the word that can give clues to meaning. Break the word up by syllables and look for ‘smaller words’ within. 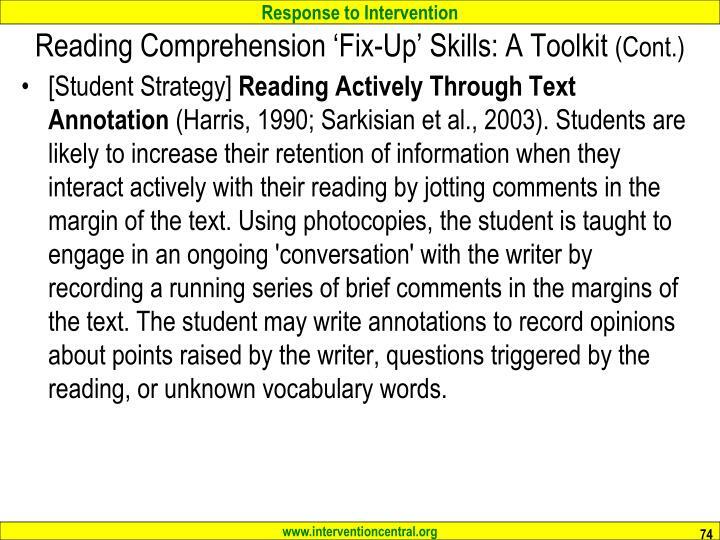 [Student Strategy] Reading Actively Through Text Annotation (Harris, 1990; Sarkisian et al., 2003). Students are likely to increase their retention of information when they interact actively with their reading by jotting comments in the margin of the text. Using photocopies, the student is taught to engage in an ongoing 'conversation' with the writer by recording a running series of brief comments in the margins of the text. The student may write annotations to record opinions about points raised by the writer, questions triggered by the reading, or unknown vocabulary words. 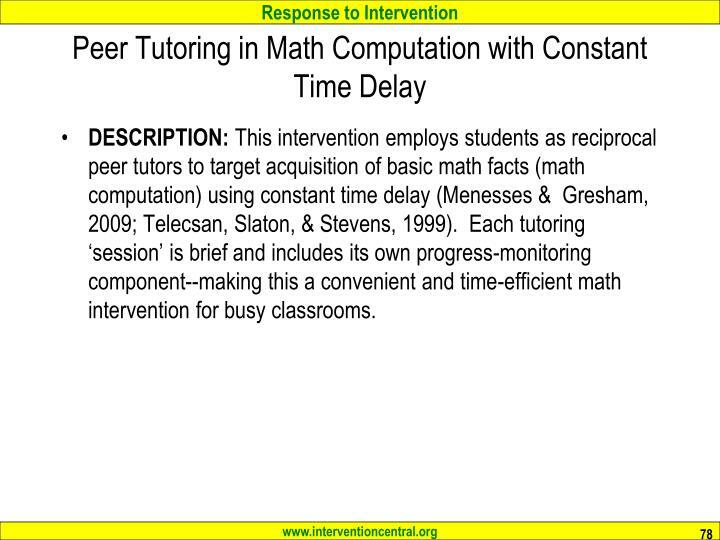 DESCRIPTION: This intervention employs students as reciprocal peer tutors to target acquisition of basic math facts (math computation) using constant time delay (Menesses & Gresham, 2009; Telecsan, Slaton, & Stevens, 1999). 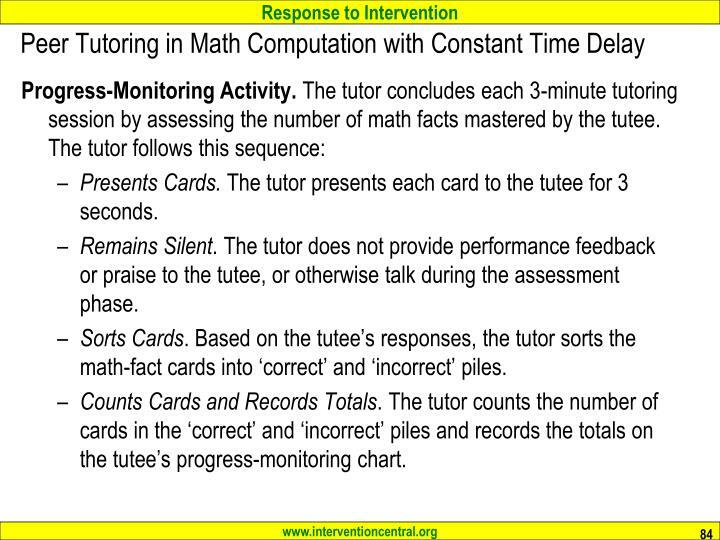 Each tutoring ‘session’ is brief and includes its own progress-monitoring component--making this a convenient and time-efficient math intervention for busy classrooms. 10 math fact cards with equations written on the front and correct answer appearing on the back. 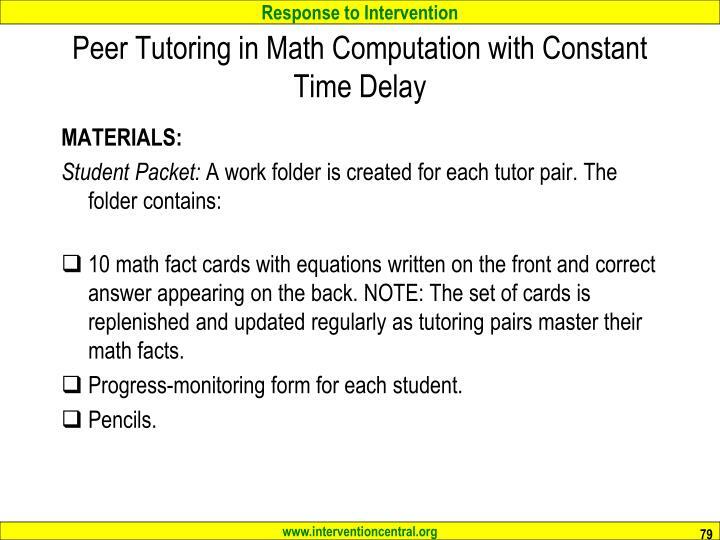 NOTE: The set of cards is replenished and updated regularly as tutoring pairs master their math facts. Progress-monitoring form for each student. PREPARATION: To prepare for the tutoring program, the teacher selects students to participate and trains them to serve as tutors. Can attend to a lesson or learning activity for at least 20 minutes. Is able to name all numbers from 0 to 18 (if tutoring in addition or subtraction math facts) and name all numbers from 0 to 81 (if tutoring in multiplication or division math facts). Can correctly read aloud a sampling of 10 math-facts (equation plus answer) that will be used in the tutoring sessions. (NOTE: The student does not need to have memorized or otherwise mastered these math facts to participate—just be able to read them aloud from cards without errors). 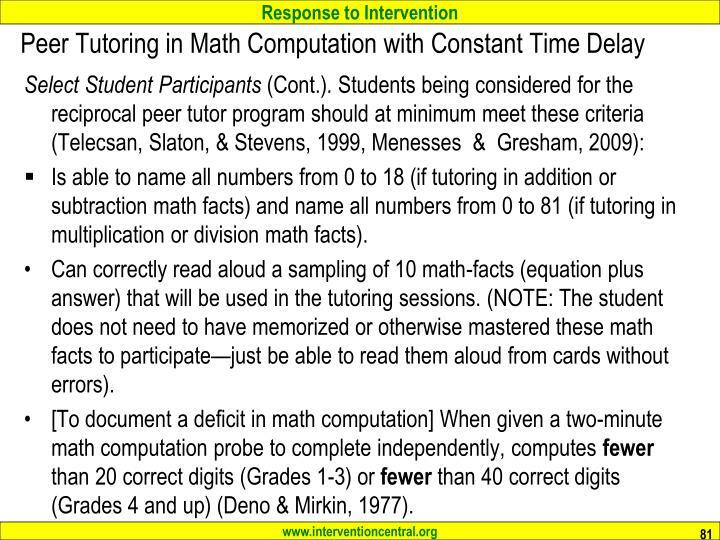 [To document a deficit in math computation] When given a two-minute math computation probe to complete independently, computes fewer than 20 correct digits (Grades 1-3) or fewer than 40 correct digits (Grades 4 and up) (Deno & Mirkin, 1977). Presents Cards. The tutor presents each card to the tutee for 3 seconds. 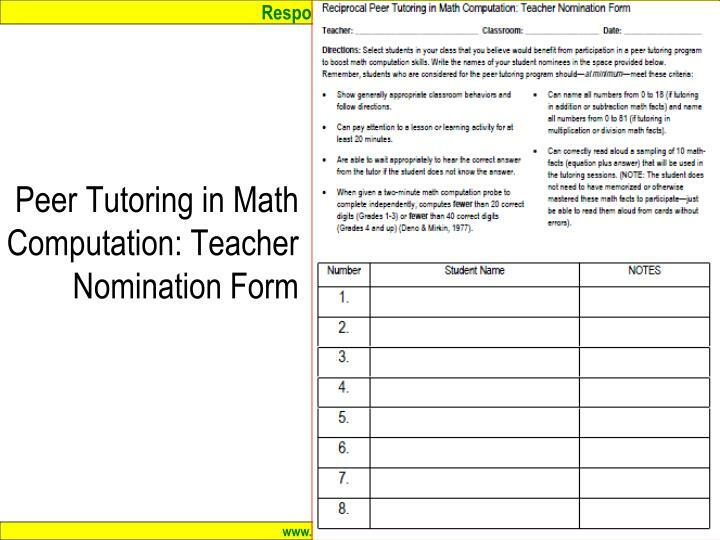 Provides Tutor Feedback. [When the tutee responds correctly] The tutor acknowledges the correct answer and presents the next card. [When the tutee does not respond within 3 seconds or responds incorrectly] The tutor states the correct answer and has the tutee repeat the correct answer. The tutor then presents the next card. Provides Praise. The tutor praises the tutee immediately following correct answers. Shuffles Cards. When the tutor and tutee have reviewed all of the math-fact carts, the tutor shuffles them before again presenting cards. Remains Silent. 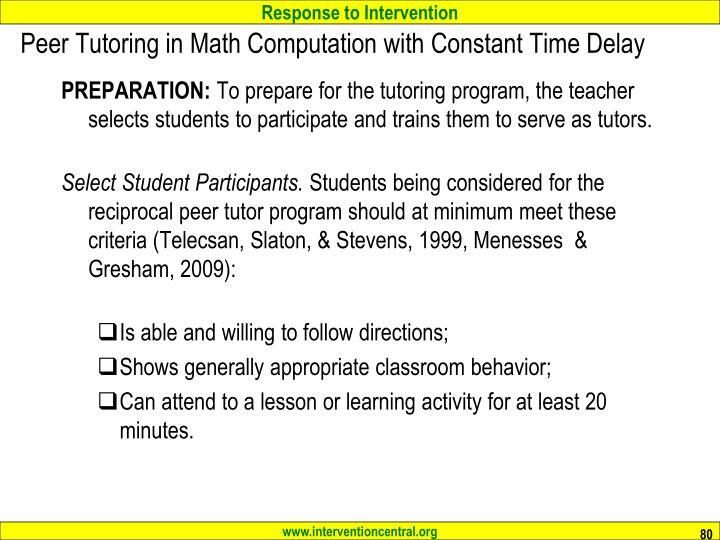 The tutor does not provide performance feedback or praise to the tutee, or otherwise talk during the assessment phase. Sorts Cards. 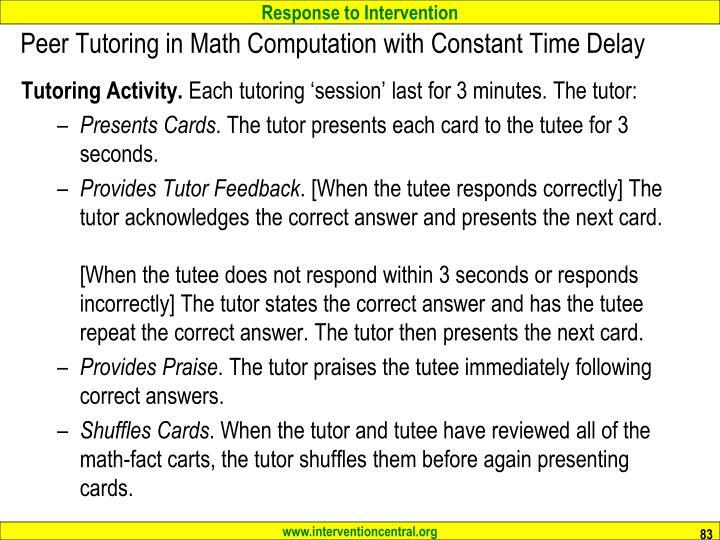 Based on the tutee’s responses, the tutor sorts the math-fact cards into ‘correct’ and ‘incorrect’ piles. Counts Cards and Records Totals. The tutor counts the number of cards in the ‘correct’ and ‘incorrect’ piles and records the totals on the tutee’s progress-monitoring chart. Tutoring Integrity Checks. 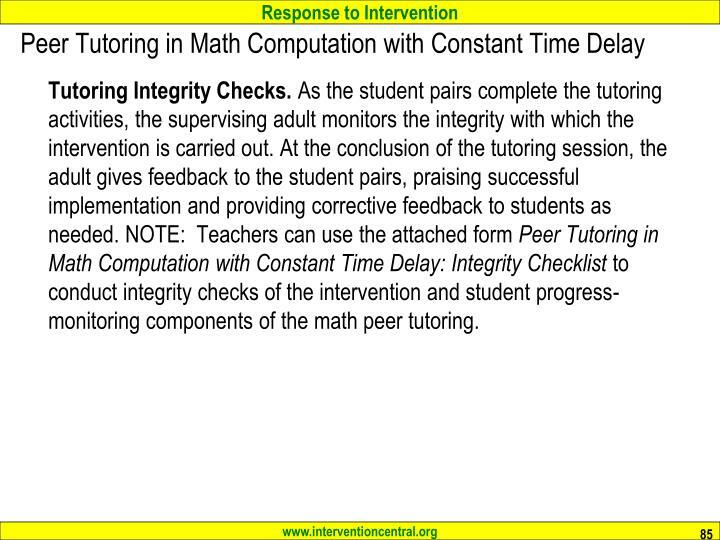 As the student pairs complete the tutoring activities, the supervising adult monitors the integrity with which the intervention is carried out. At the conclusion of the tutoring session, the adult gives feedback to the student pairs, praising successful implementation and providing corrective feedback to students as needed. 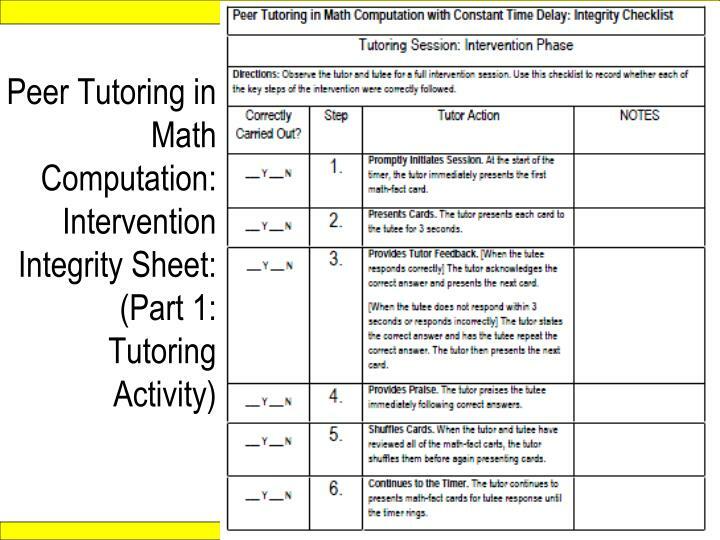 NOTE: Teachers can use the attached form Peer Tutoring in Math Computation with Constant Time Delay: Integrity Checklist to conduct integrity checks of the intervention and student progress-monitoring components of the math peer tutoring. 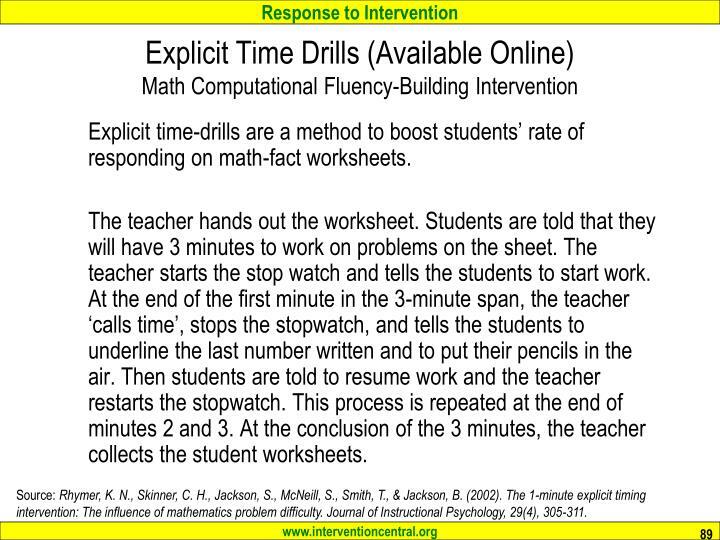 Explicit time-drills are a method to boost students’ rate of responding on math-fact worksheets. The teacher hands out the worksheet. Students are told that they will have 3 minutes to work on problems on the sheet. The teacher starts the stop watch and tells the students to start work. At the end of the first minute in the 3-minute span, the teacher ‘calls time’, stops the stopwatch, and tells the students to underline the last number written and to put their pencils in the air. Then students are told to resume work and the teacher restarts the stopwatch. This process is repeated at the end of minutes 2 and 3. At the conclusion of the 3 minutes, the teacher collects the student worksheets. Source: Rhymer, K. N., Skinner, C. H., Jackson, S., McNeill, S., Smith, T., & Jackson, B. (2002). 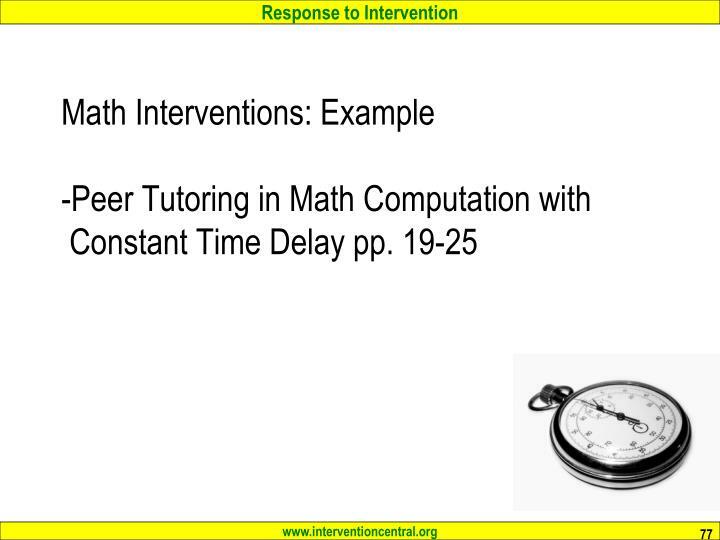 The 1-minute explicit timing intervention: The influence of mathematics problem difficulty. Journal of Instructional Psychology, 29(4), 305-311. 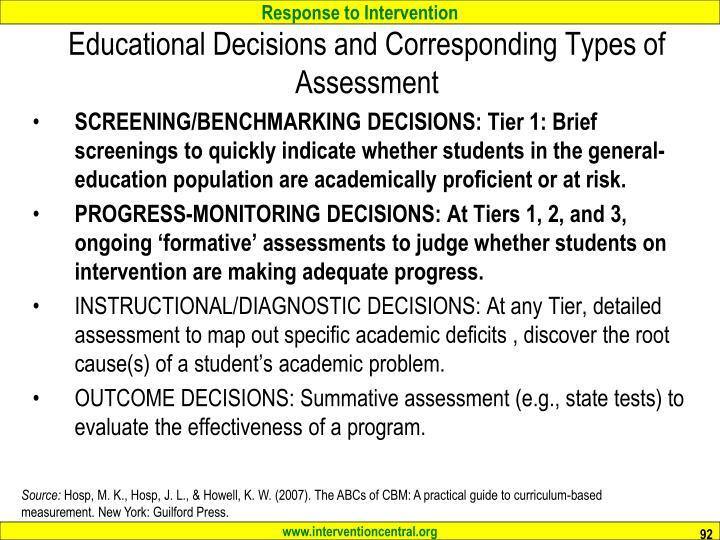 SCREENING/BENCHMARKING DECISIONS: Tier 1: Brief screenings to quickly indicate whether students in the general-education population are academically proficient or at risk. 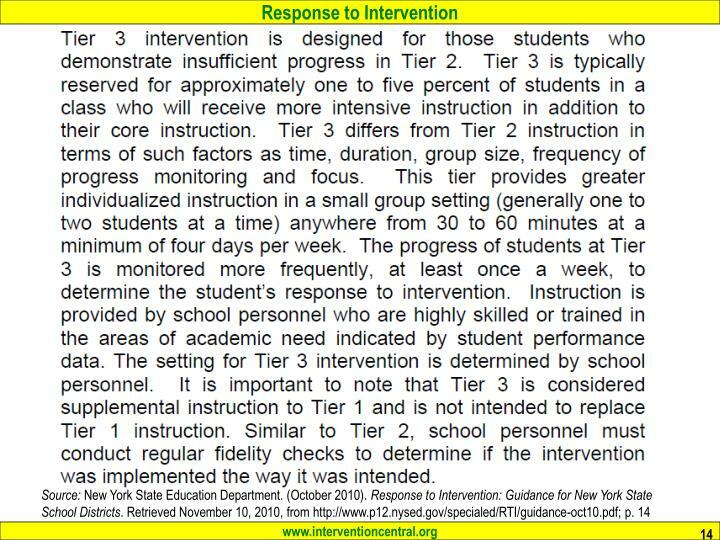 PROGRESS-MONITORING DECISIONS: At Tiers 1, 2, and 3, ongoing ‘formative’ assessments to judge whether students on intervention are making adequate progress. 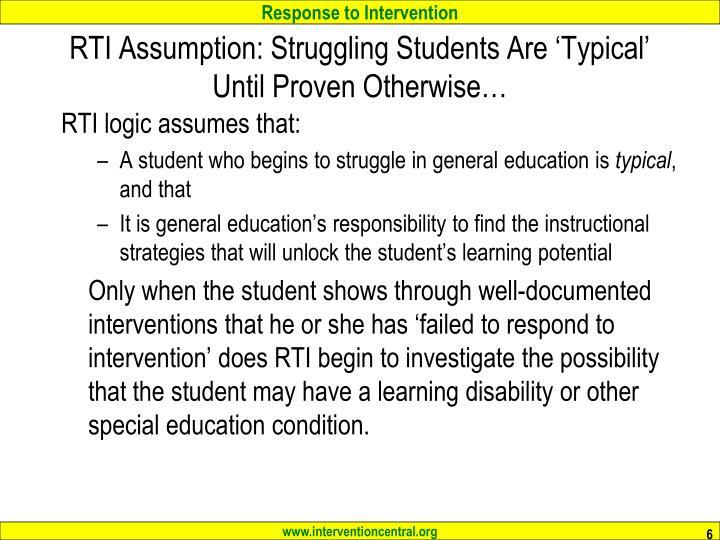 INSTRUCTIONAL/DIAGNOSTIC DECISIONS: At any Tier, detailed assessment to map out specific academic deficits , discover the root cause(s) of a student’s academic problem. OUTCOME DECISIONS: Summative assessment (e.g., state tests) to evaluate the effectiveness of a program. Source: Hosp, M. K., Hosp, J. L., & Howell, K. W. (2007). The ABCs of CBM: A practical guide to curriculum-based measurement. New York: Guilford Press. Clearly defined problem. The student’s target concern is stated in specific, observable, measureable terms. 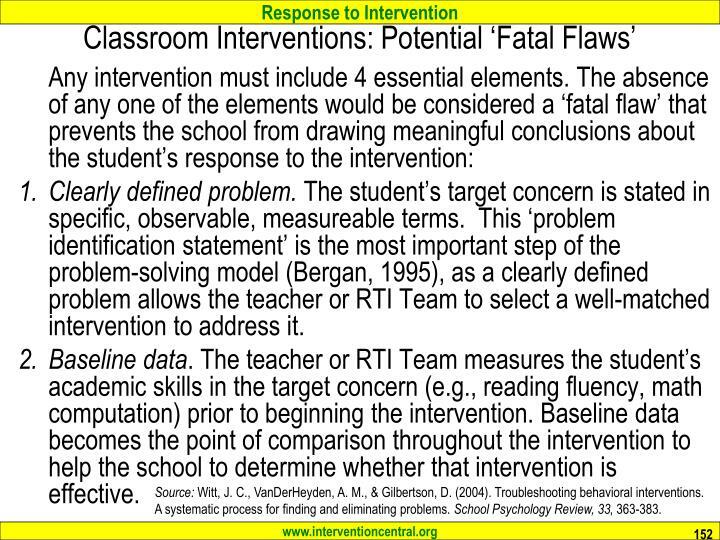 This ‘problem identification statement’ is the most important step of the problem-solving model (Bergan, 1995), as a clearly defined problem allows the teacher or RTI Team to select a well-matched intervention to address it. Baseline data. 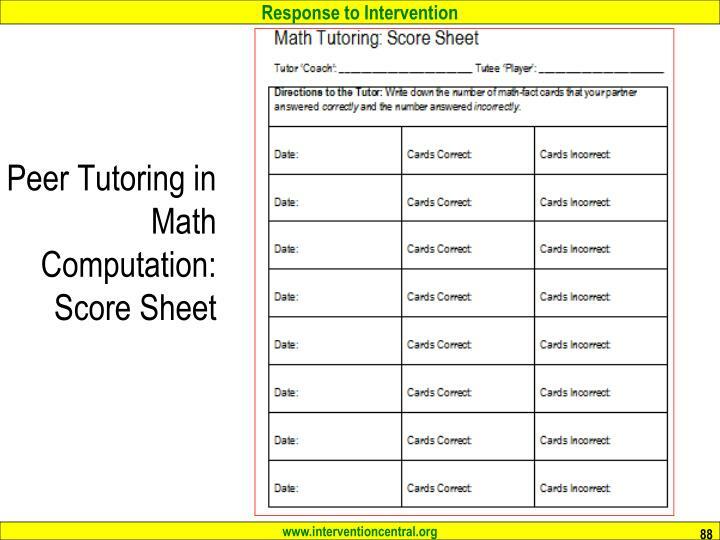 The teacher or RTI Team measures the student’s academic skills in the target concern (e.g., reading fluency, math computation) prior to beginning the intervention. 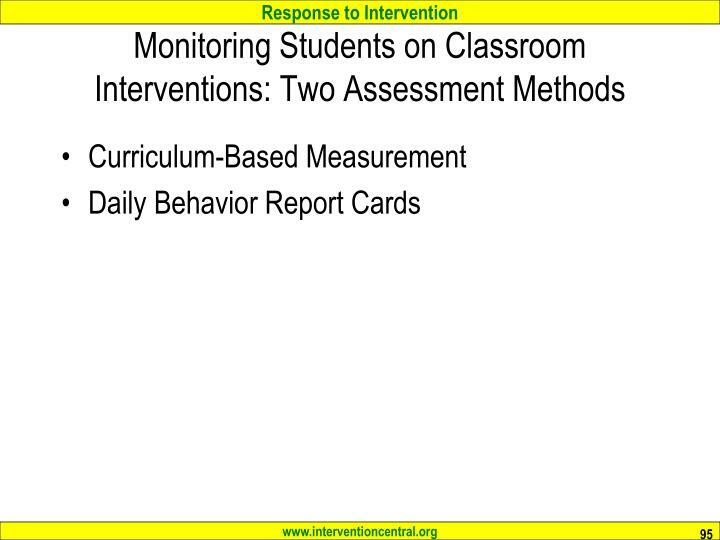 Baseline data becomes the point of comparison throughout the intervention to help the school to determine whether that intervention is effective. Source: Witt, J. C., VanDerHeyden, A. M., & Gilbertson, D. (2004). 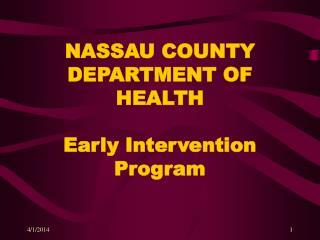 Troubleshooting behavioral interventions. A systematic process for finding and eliminating problems. School Psychology Review, 33, 363-383. Performance goal. 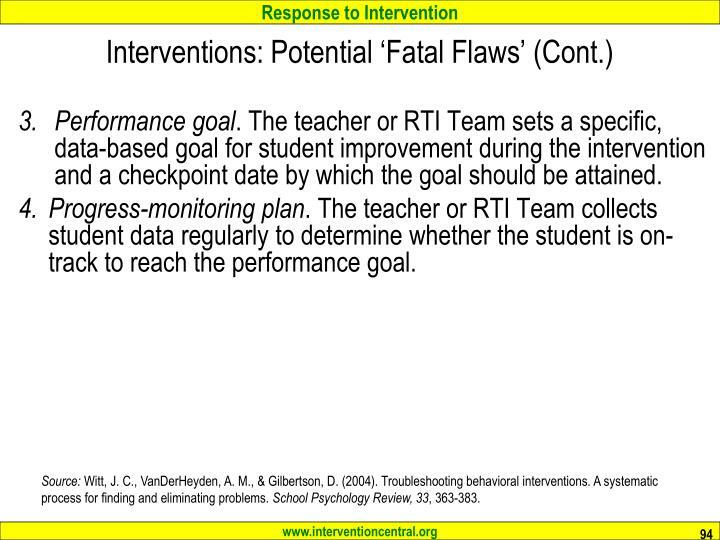 The teacher or RTI Team sets a specific, data-based goal for student improvement during the intervention and a checkpoint date by which the goal should be attained. Progress-monitoring plan. The teacher or RTI Team collects student data regularly to determine whether the student is on-track to reach the performance goal. Curriculum-Based Measurement. 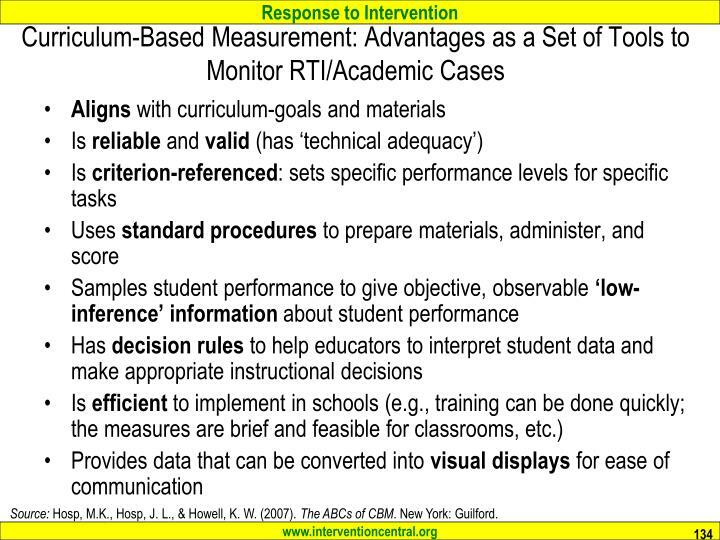 Curriculum-Based Measurement (CBM) is a family of brief, timed measures that assess basic academic skills. CBMs have been developed to assess phonemic awareness, oral reading fluency, number sense, math computation, spelling, written expression and other skills. 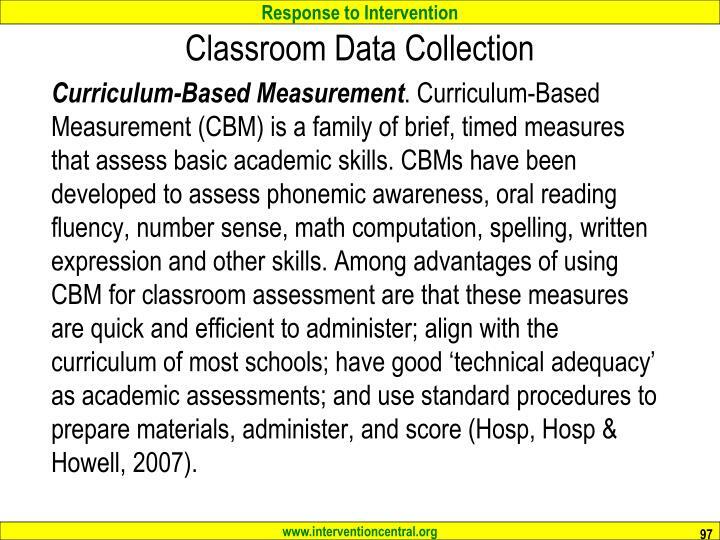 Among advantages of using CBM for classroom assessment are that these measures are quick and efficient to administer; align with the curriculum of most schools; have good ‘technical adequacy’ as academic assessments; and use standard procedures to prepare materials, administer, and score (Hosp, Hosp & Howell, 2007). Source: Hosp, M.K., Hosp, J. L., & Howell, K. W. (2007). The ABCs of CBM. New York: Guilford. 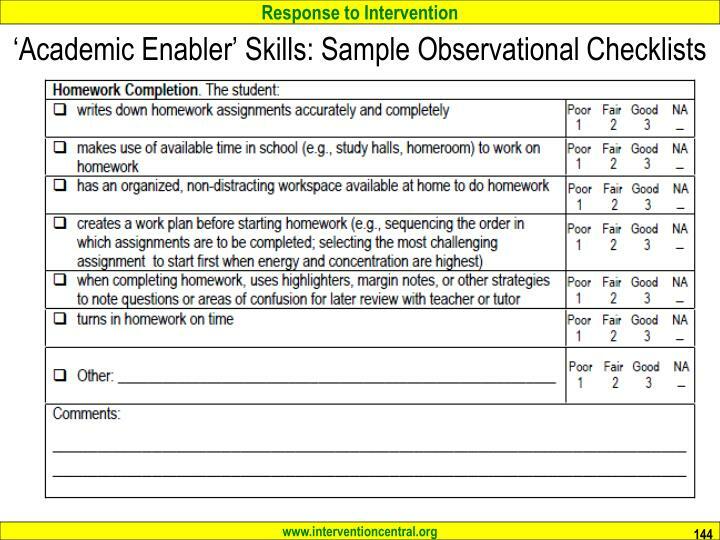 Description: Worksheet contains either single-skill or multiple-skill problems. 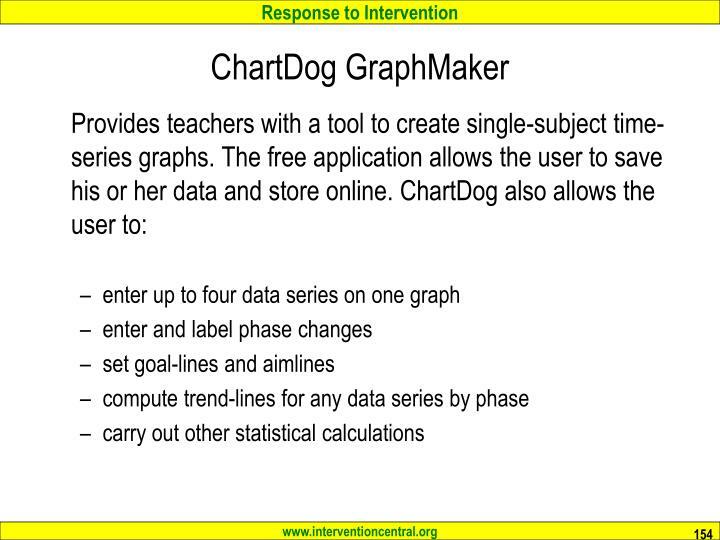 Administration: Can be administered to groups (e.g., whole class). Students have 2 minutes to complete worksheet. Scoring: Students get credit for each correct digit-a method that is more sensitive to short-term student gain. 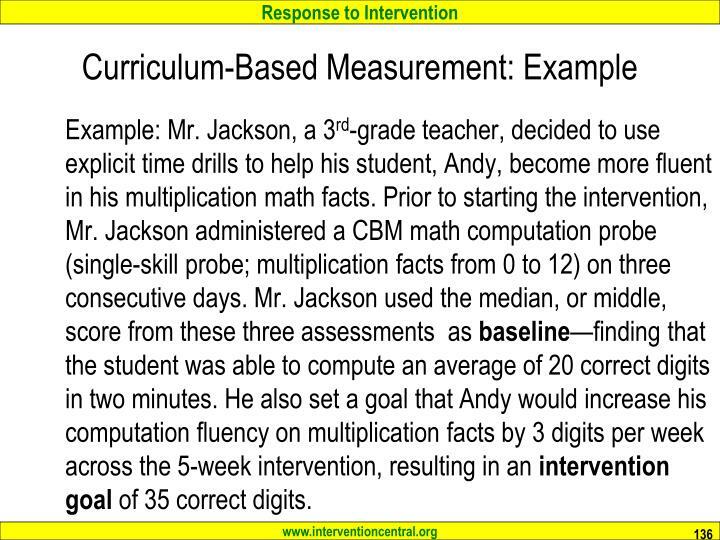 Example: Mr. Jackson, a 3rd-grade teacher, decided to use explicit time drills to help his student, Andy, become more fluent in his multiplication math facts. 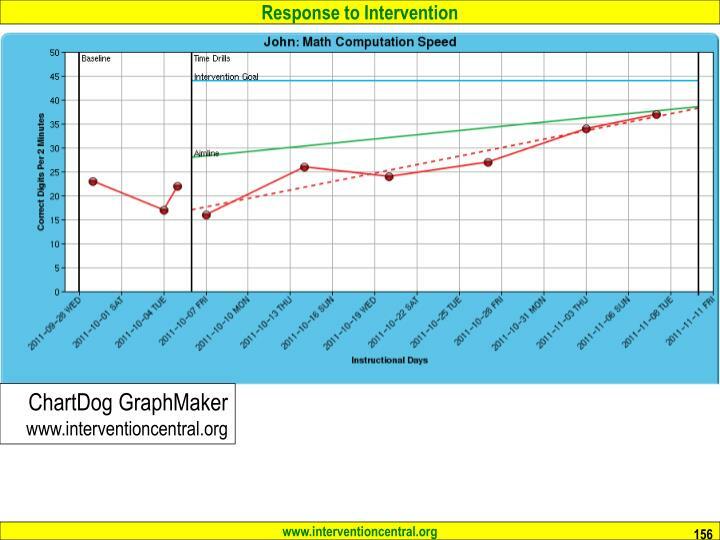 Prior to starting the intervention, Mr. Jackson administered a CBM math computation probe (single-skill probe; multiplication facts from 0 to 12) on three consecutive days. 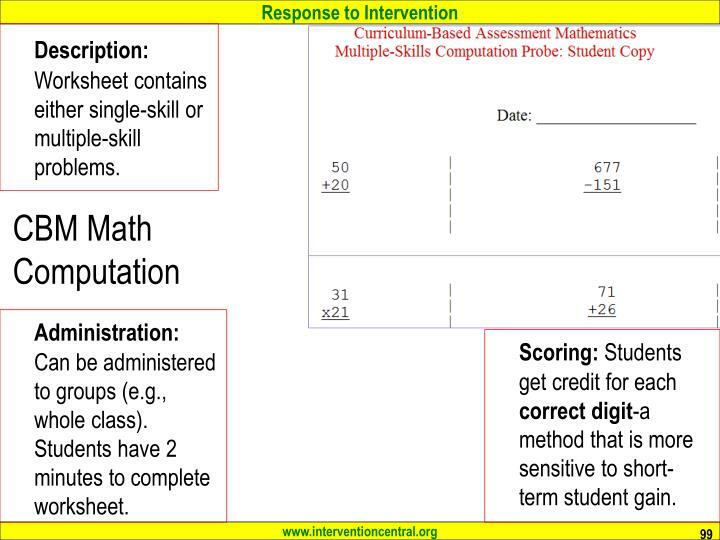 Mr. Jackson used the median, or middle, score from these three assessments as baseline—finding that the student was able to compute an average of 20 correct digits in two minutes. 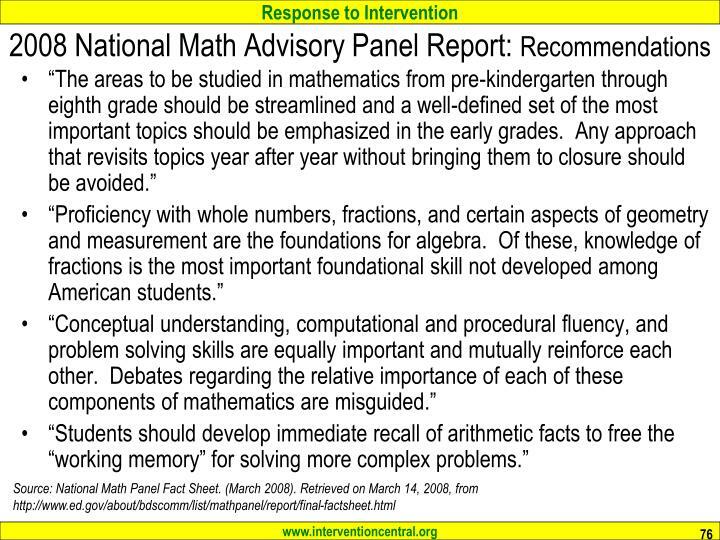 He also set a goal that Andy would increase his computation fluency on multiplication facts by 3 digits per week across the 5-week intervention, resulting in an intervention goal of 35 correct digits. 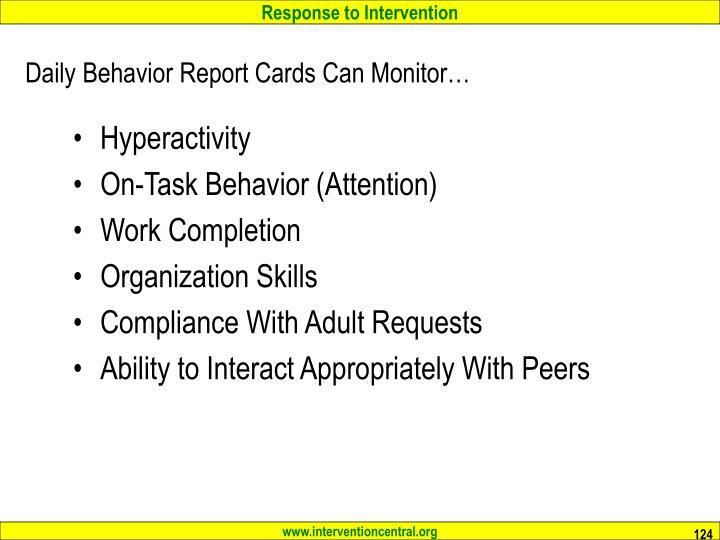 brief forms containing student behavior-rating items. 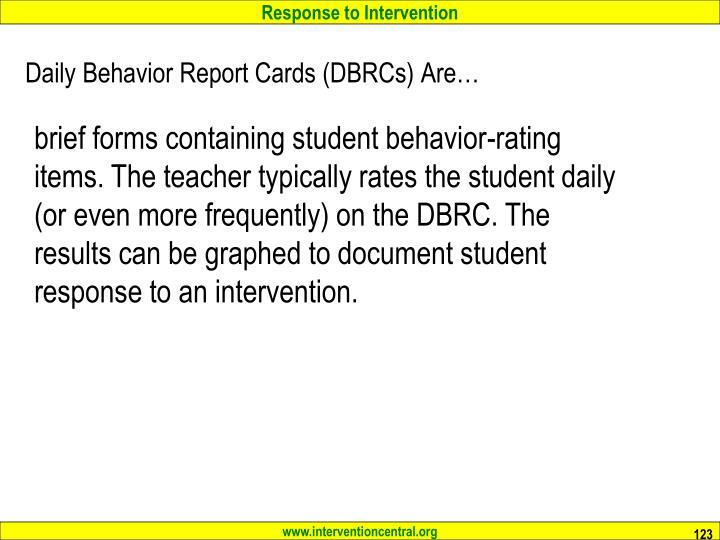 The teacher typically rates the student daily (or even more frequently) on the DBRC. 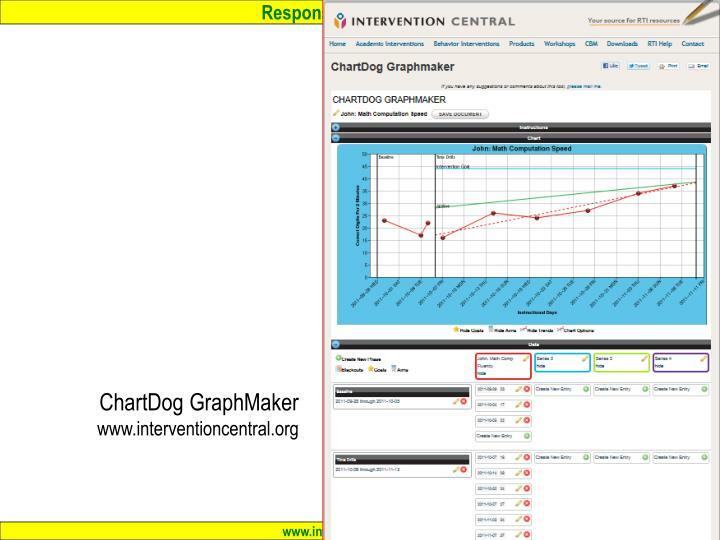 The results can be graphed to document student response to an intervention. Brian focused his attention on teacher instructions, classroom lessons and assigned work. Brian completed and turned in his assigned class work on time. Brian spoke respectfully and complied with adult requests without argument or complaint. 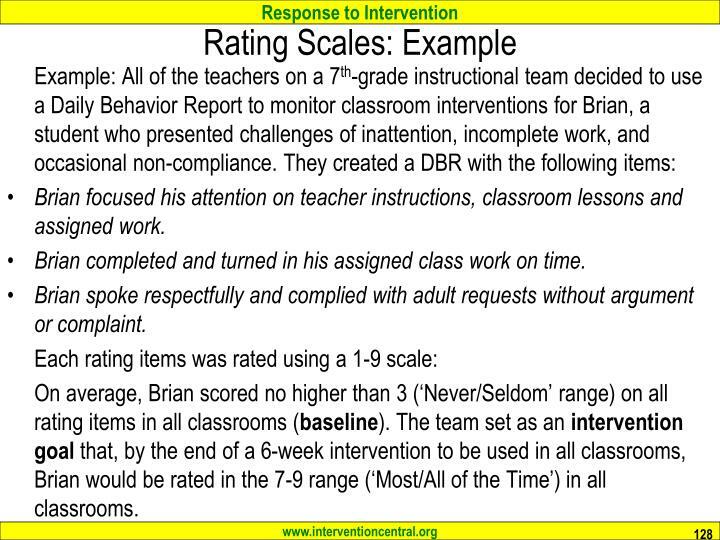 On average, Brian scored no higher than 3 (‘Never/Seldom’ range) on all rating items in all classrooms (baseline). 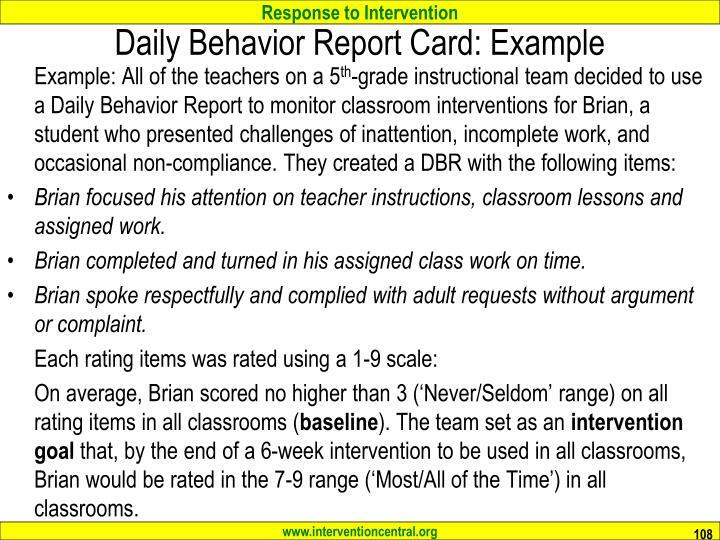 The team set as an intervention goal that, by the end of a 6-week intervention to be used in all classrooms, Brian would be rated in the 7-9 range (‘Most/All of the Time’) in all classrooms. 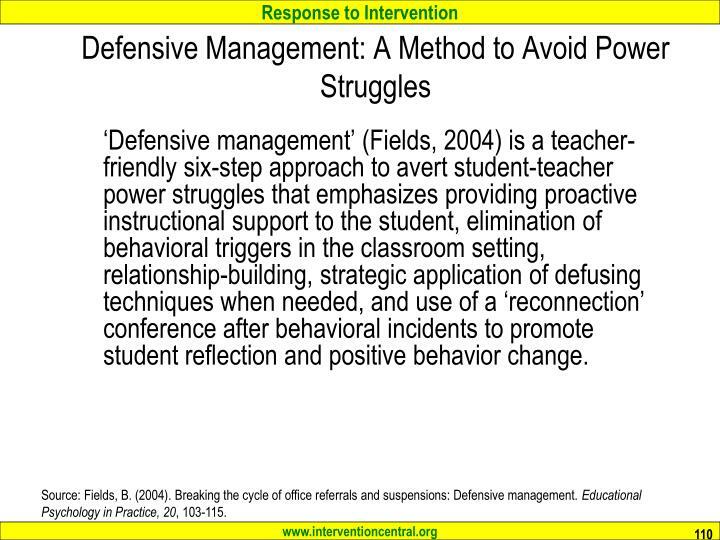 ‘Defensive management’ (Fields, 2004) is a teacher-friendly six-step approach to avert student-teacher power struggles that emphasizes providing proactive instructional support to the student, elimination of behavioral triggers in the classroom setting, relationship-building, strategic application of defusing techniques when needed, and use of a ‘reconnection’ conference after behavioral incidents to promote student reflection and positive behavior change. Source: Fields, B. (2004). Breaking the cycle of office referrals and suspensions: Defensive management. Educational Psychology in Practice, 20, 103-115. Understanding the Student Problem and Using Proactive Strategies to Prevent ‘Triggers’. 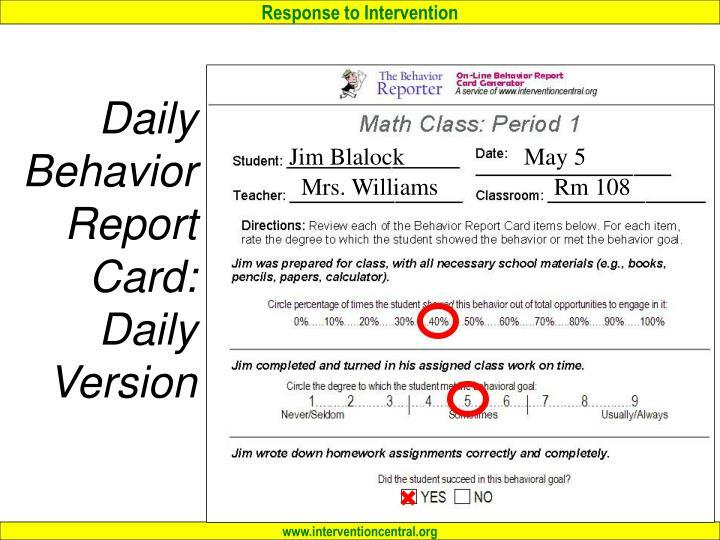 The teacher collects information--through direct observation and perhaps other means--about specific instances of student problem behavior and the instructional components and other factors surrounding them. 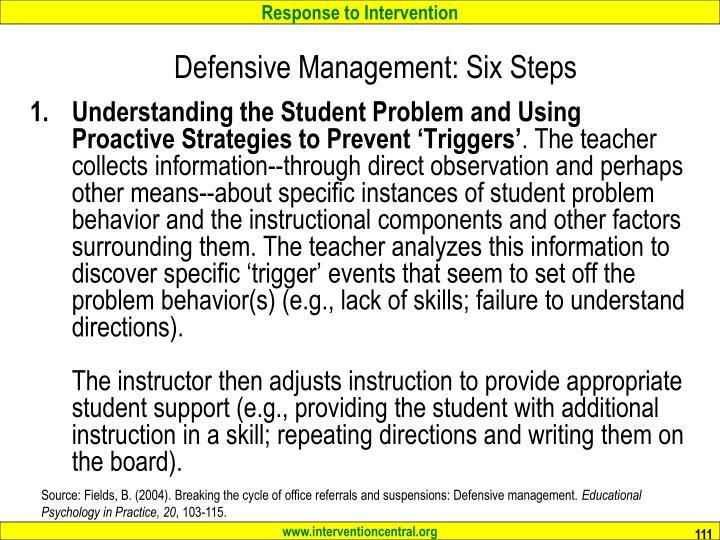 The teacher analyzes this information to discover specific ‘trigger’ events that seem to set off the problem behavior(s) (e.g., lack of skills; failure to understand directions).The instructor then adjusts instruction to provide appropriate student support (e.g., providing the student with additional instruction in a skill; repeating directions and writing them on the board). 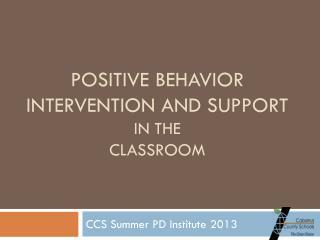 Promoting Positive Teacher-Student Interactions. Early in each class session, the teacher has at least one positive verbal interaction with the student. 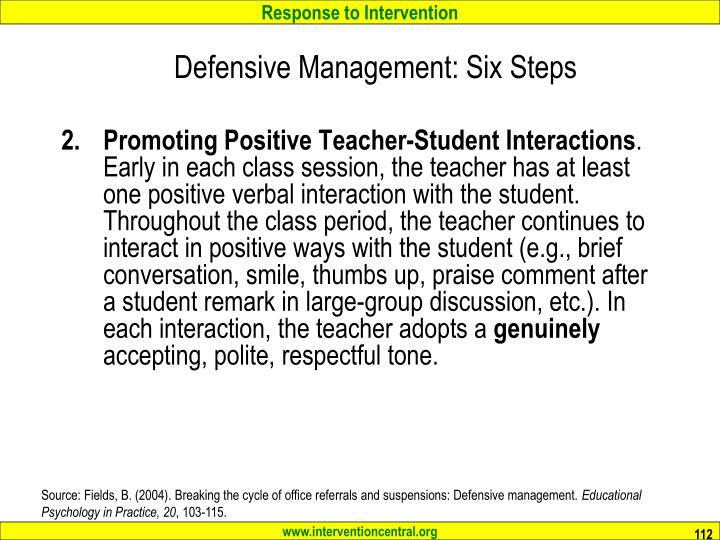 Throughout the class period, the teacher continues to interact in positive ways with the student (e.g., brief conversation, smile, thumbs up, praise comment after a student remark in large-group discussion, etc.). In each interaction, the teacher adopts a genuinely accepting, polite, respectful tone. Scanning for Warning Indicators. 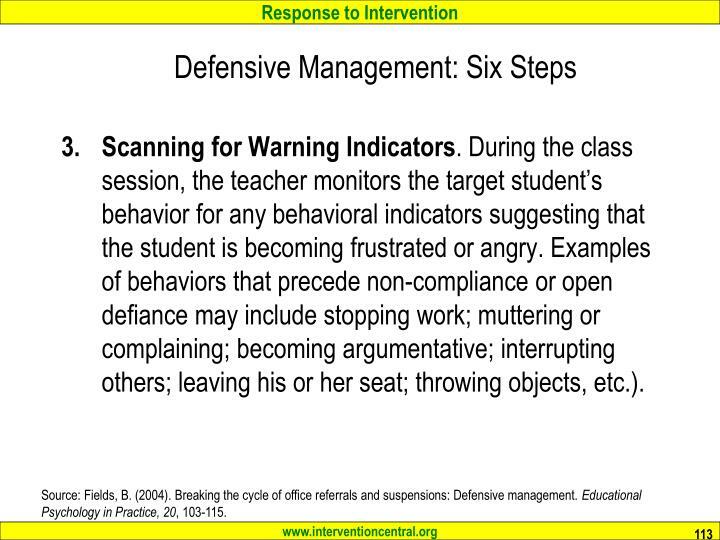 During the class session, the teacher monitors the target student’s behavior for any behavioral indicators suggesting that the student is becoming frustrated or angry. Examples of behaviors that precede non-compliance or open defiance may include stopping work; muttering or complaining; becoming argumentative; interrupting others; leaving his or her seat; throwing objects, etc.). Exercising Emotional Restraint. 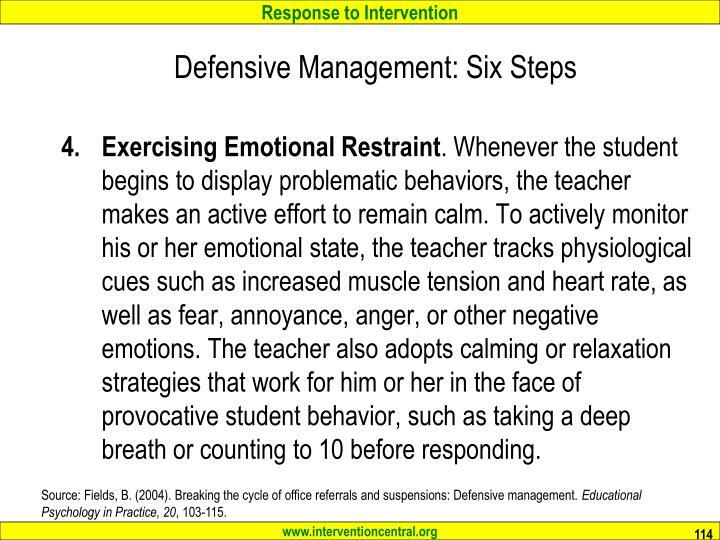 Whenever the student begins to display problematic behaviors, the teacher makes an active effort to remain calm. To actively monitor his or her emotional state, the teacher tracks physiological cues such as increased muscle tension and heart rate, as well as fear, annoyance, anger, or other negative emotions. The teacher also adopts calming or relaxation strategies that work for him or her in the face of provocative student behavior, such as taking a deep breath or counting to 10 before responding. Using Defusing Tactics. 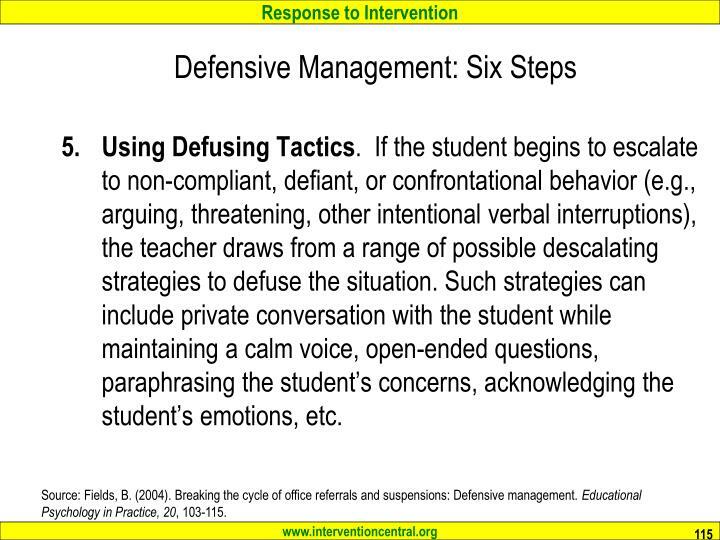 If the student begins to escalate to non-compliant, defiant, or confrontational behavior (e.g., arguing, threatening, other intentional verbal interruptions), the teacher draws from a range of possible descalating strategies to defuse the situation. 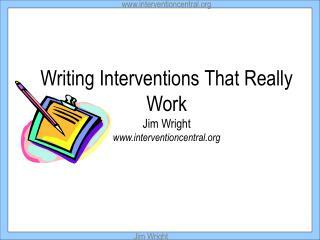 Such strategies can include private conversation with the student while maintaining a calm voice, open-ended questions, paraphrasing the student’s concerns, acknowledging the student’s emotions, etc. Conducting a ‘Reconnection’ Conference. 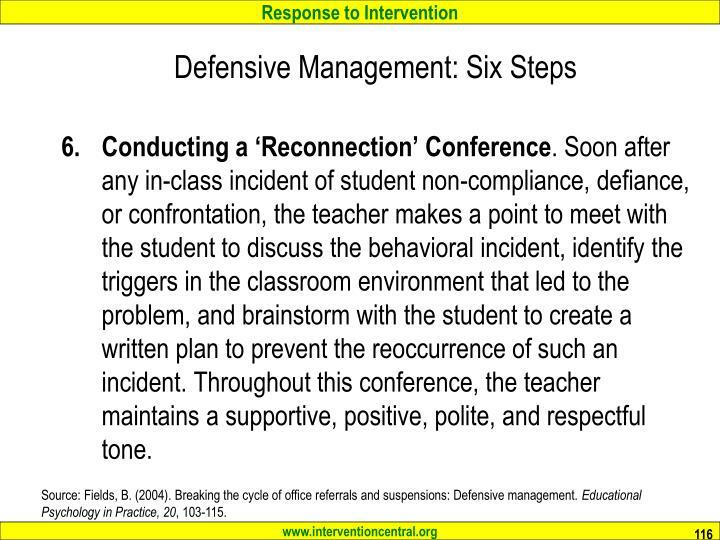 Soon after any in-class incident of student non-compliance, defiance, or confrontation, the teacher makes a point to meet with the student to discuss the behavioral incident, identify the triggers in the classroom environment that led to the problem, and brainstorm with the student to create a written plan to prevent the reoccurrence of such an incident. Throughout this conference, the teacher maintains a supportive, positive, polite, and respectful tone. Group Activity: How Can the Six-Step Process Be Used in ALL Classrooms? Understanding the Student Problem and Using Proactive Strategies to Prevent ‘Triggers’. Conducting a Student ‘Reconnection’ Conference. 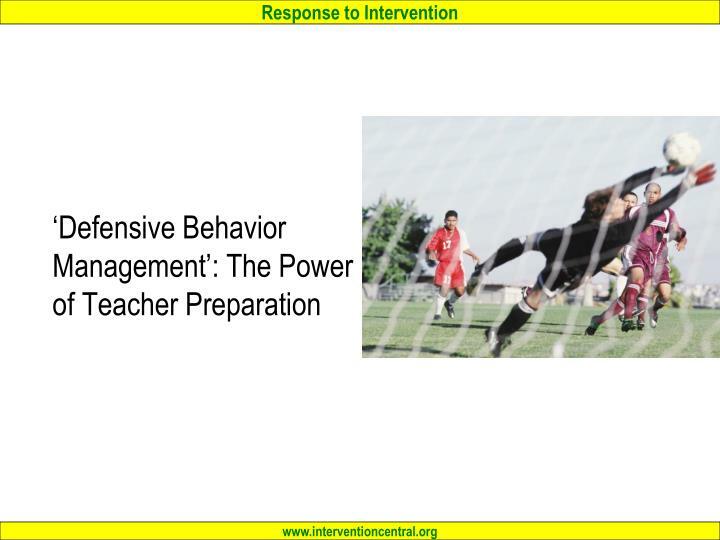 Discuss the 6-step defensive behavior management approach. How can your school encourage teachers in all classrooms to use this approach? Rating scales. A scale is developed with one or more items that a rater can use to complete a global rating of a behavior. 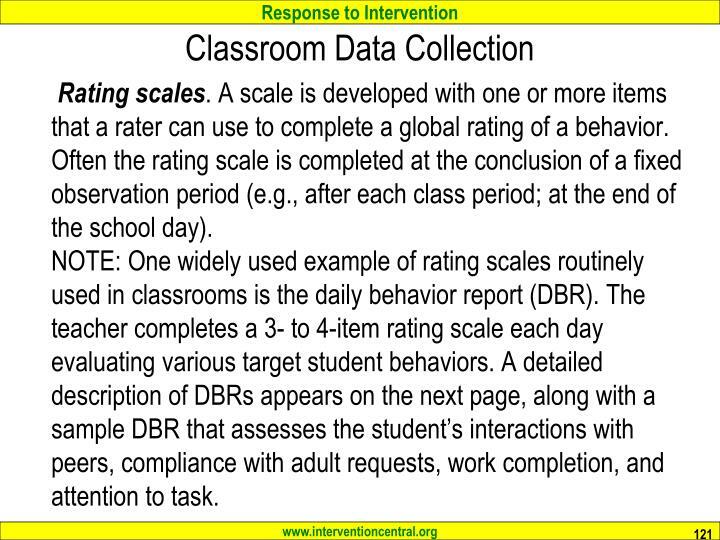 Often the rating scale is completed at the conclusion of a fixed observation period (e.g., after each class period; at the end of the school day).NOTE: One widely used example of rating scales routinely used in classrooms is the daily behavior report (DBR). 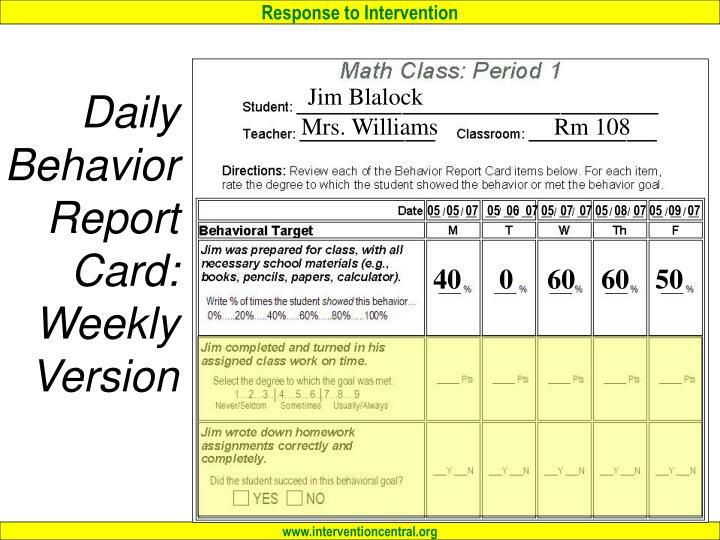 The teacher completes a 3- to 4-item rating scale each day evaluating various target student behaviors. A detailed description of DBRs appears on the next page, along with a sample DBR that assesses the student’s interactions with peers, compliance with adult requests, work completion, and attention to task. 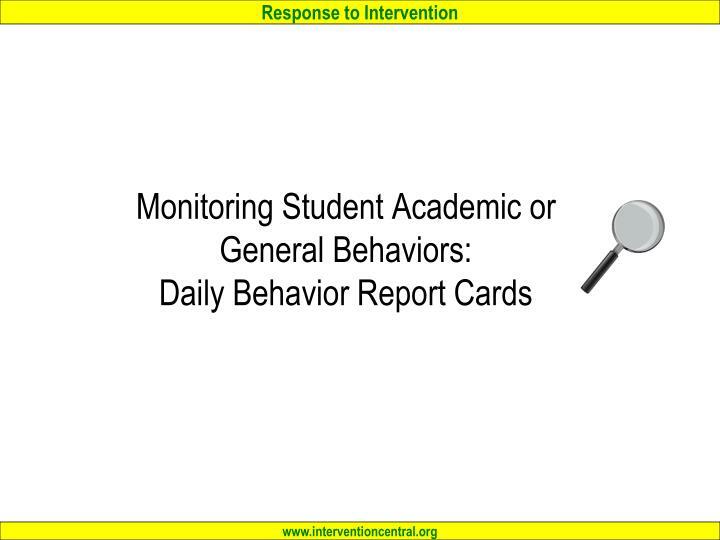 Discuss the Daily Behavior Report Card as a classroom monitoring tool. 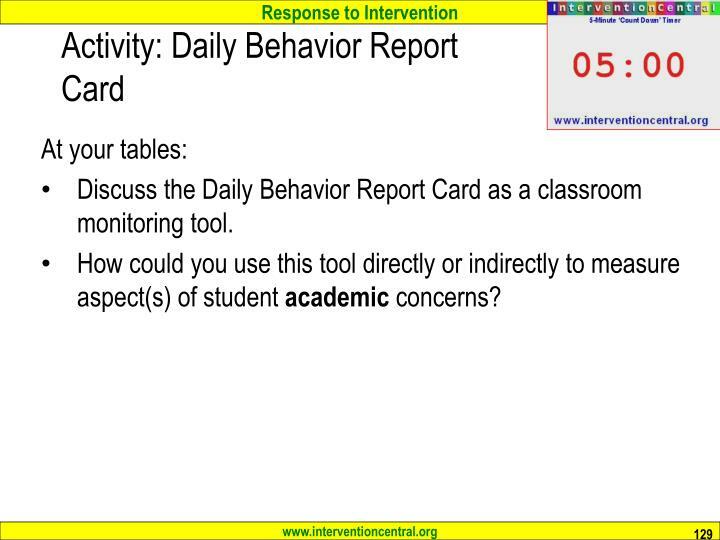 How could you use this tool directly or indirectly to measure aspect(s) of student academic concerns? Academic Skills: Cumulative Mastery Log. 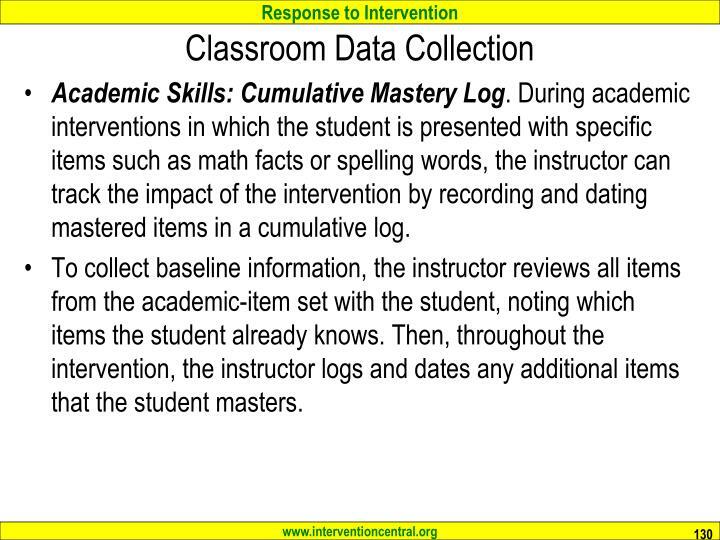 During academic interventions in which the student is presented with specific items such as math facts or spelling words, the instructor can track the impact of the intervention by recording and dating mastered items in a cumulative log. To collect baseline information, the instructor reviews all items from the academic-item set with the student, noting which items the student already knows. Then, throughout the intervention, the instructor logs and dates any additional items that the student masters. 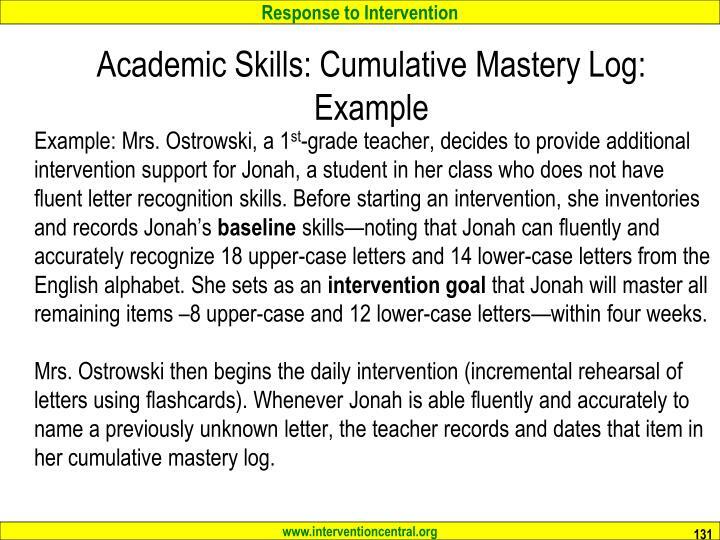 Example: Mrs. Ostrowski, a 1st-grade teacher, decides to provide additional intervention support for Jonah, a student in her class who does not have fluent letter recognition skills. 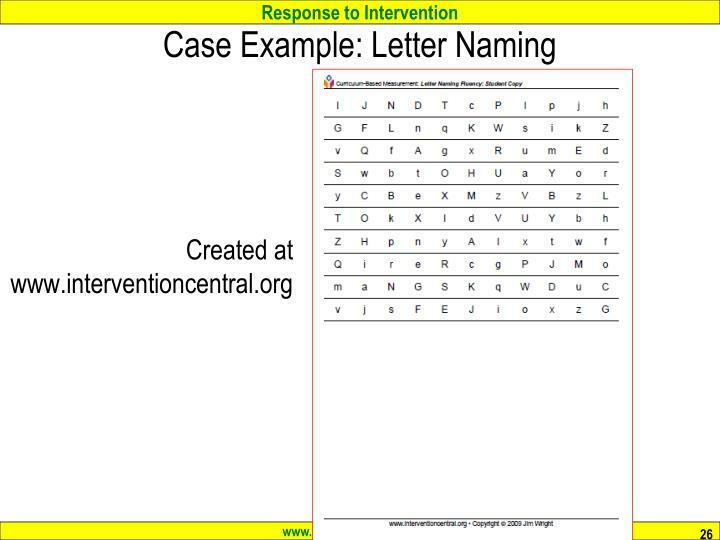 Before starting an intervention, she inventories and records Jonah’s baseline skills—noting that Jonah can fluently and accurately recognize 18 upper-case letters and 14 lower-case letters from the English alphabet. She sets as an intervention goal that Jonah will master all remaining items –8 upper-case and 12 lower-case letters—within four weeks. Mrs. Ostrowski then begins the daily intervention (incremental rehearsal of letters using flashcards). Whenever Jonah is able fluently and accurately to name a previously unknown letter, the teacher records and dates that item in her cumulative mastery log. 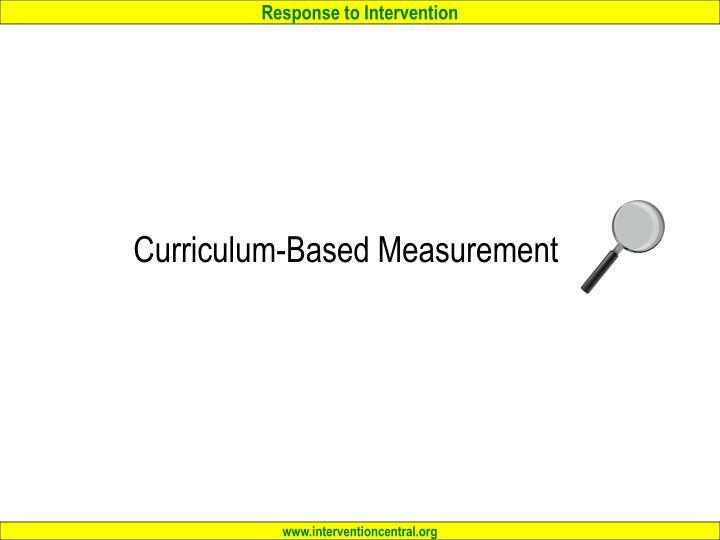 Curriculum-Based Measurement. 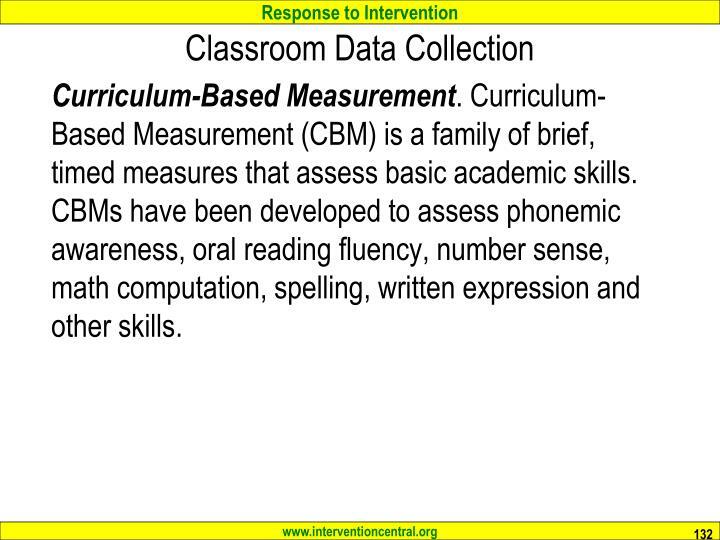 Curriculum-Based Measurement (CBM) is a family of brief, timed measures that assess basic academic skills. 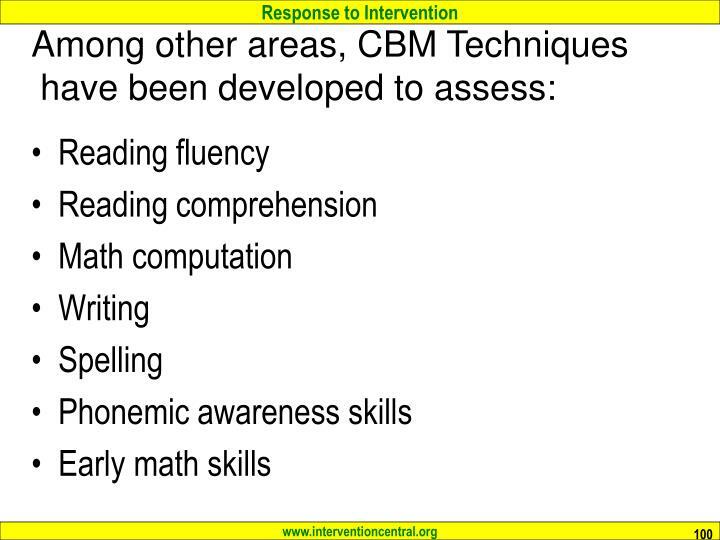 CBMs have been developed to assess phonemic awareness, oral reading fluency, number sense, math computation, spelling, written expression and other skills. Global skill checklist. The teacher selects a global skill (e.g., homework completion; independent seatwork). The teacher then breaks the global skill down into a checklist of component sub-skills--a process known as ‘discrete categorization’ (Kazdin, 1989). 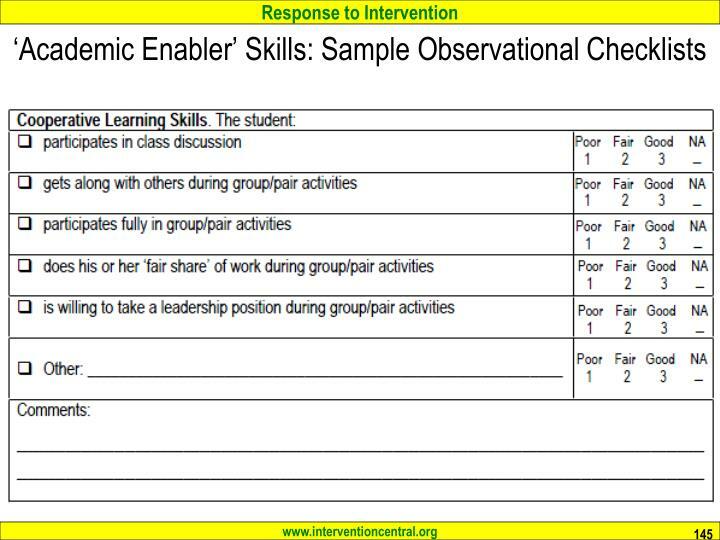 An observer (e.g., teacher, another adult, or even the student) can then use the checklist to note whether a student successfully displays each of the sub-skills on a given day. 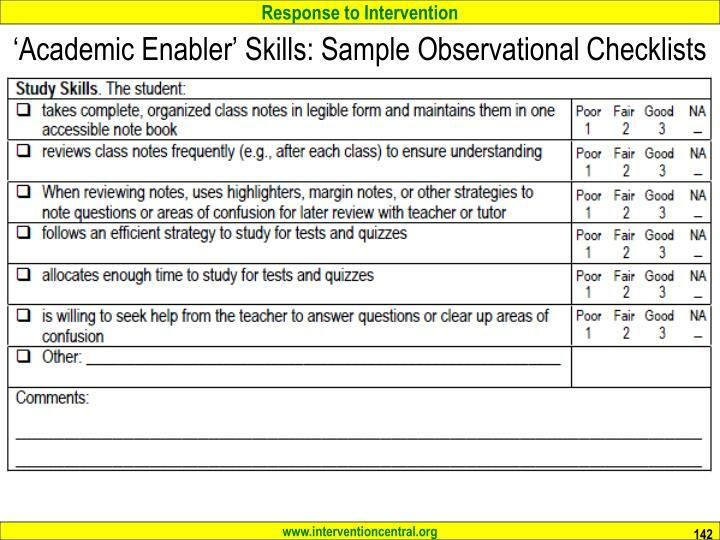 Classroom teachers can use these checklists as convenient tools to assess whether a student has the minimum required range of academic enabling skills for classroom success. ‘Academic Enabler’ Skills: Why Are They Important? Source: DiPerna, J. C. (2006). 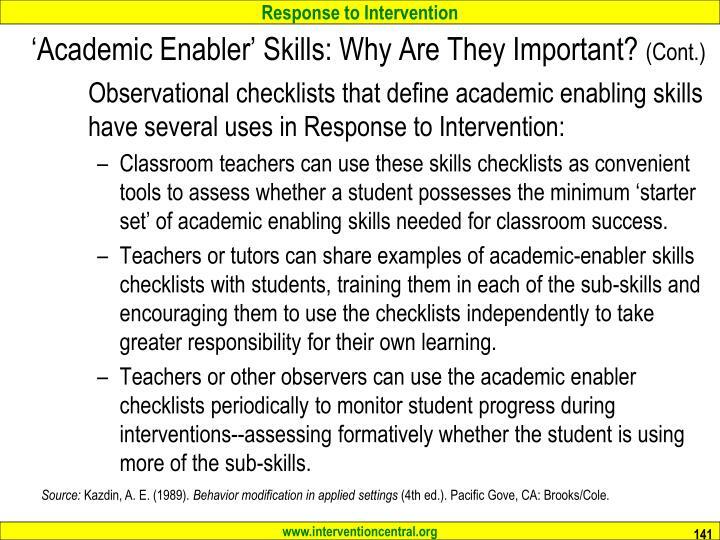 Academic enablers and student achievement: Implications for assessment and intervention services in the schools. Psychology in the Schools, 43, 7-17. Because academic enablers are often described as broad skill sets, however, they can be challenging to define in clear, specific, measureable terms. 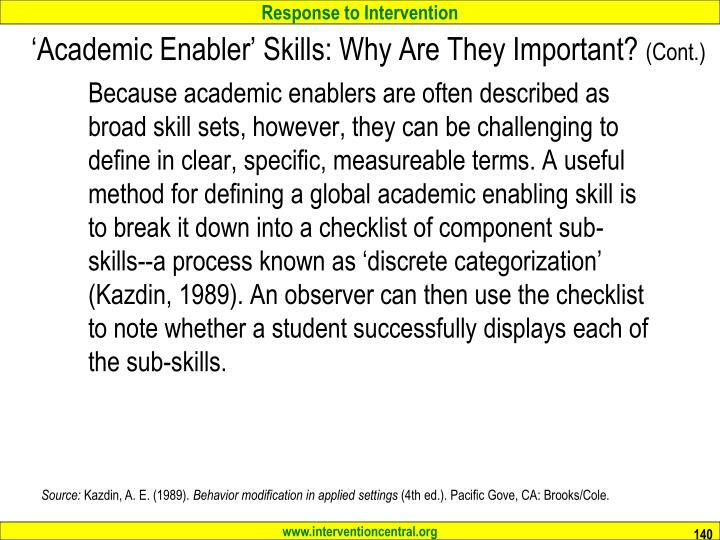 A useful method for defining a global academic enabling skill is to break it down into a checklist of component sub-skills--a process known as ‘discrete categorization’ (Kazdin, 1989). 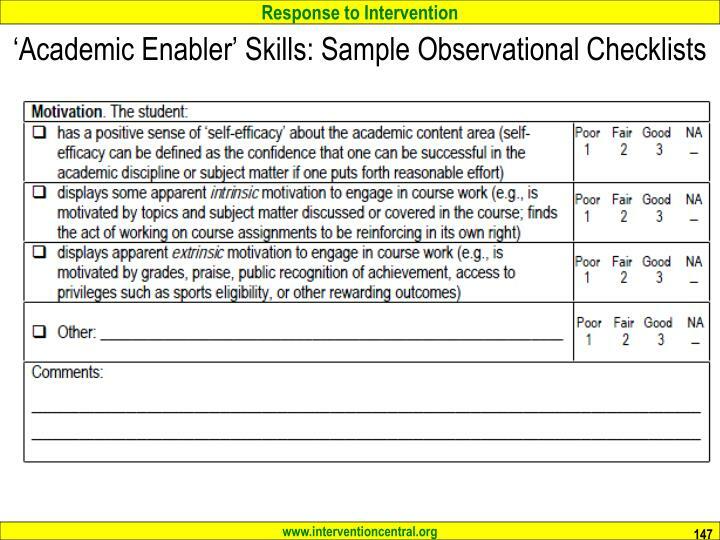 An observer can then use the checklist to note whether a student successfully displays each of the sub-skills. Source: Kazdin, A. E. (1989). Behavior modification in applied settings (4th ed.). Pacific Gove, CA: Brooks/Cole. 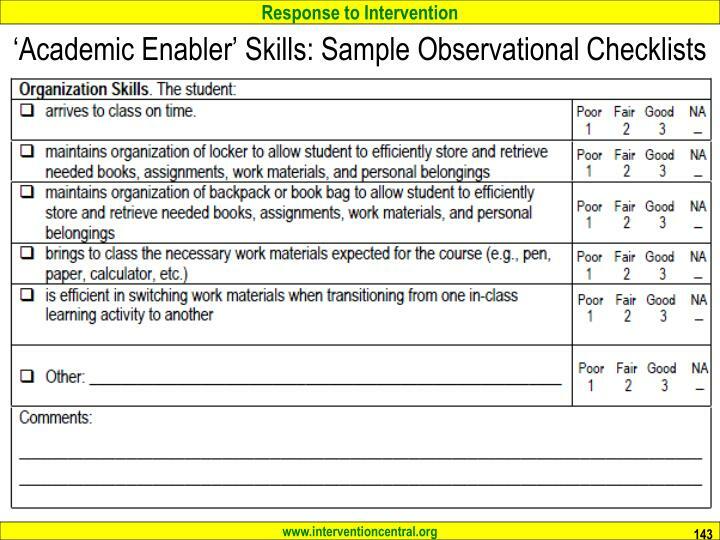 Classroom teachers can use these skills checklists as convenient tools to assess whether a student possesses the minimum ‘starter set’ of academic enabling skills needed for classroom success. 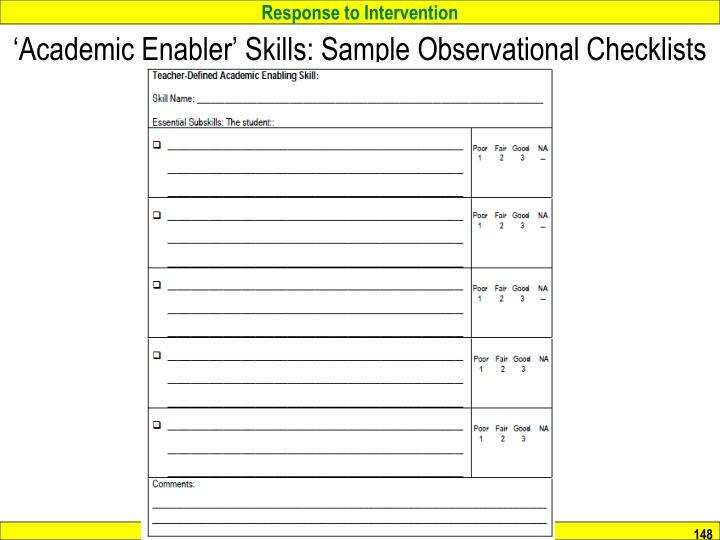 Teachers or tutors can share examples of academic-enabler skills checklists with students, training them in each of the sub-skills and encouraging them to use the checklists independently to take greater responsibility for their own learning. 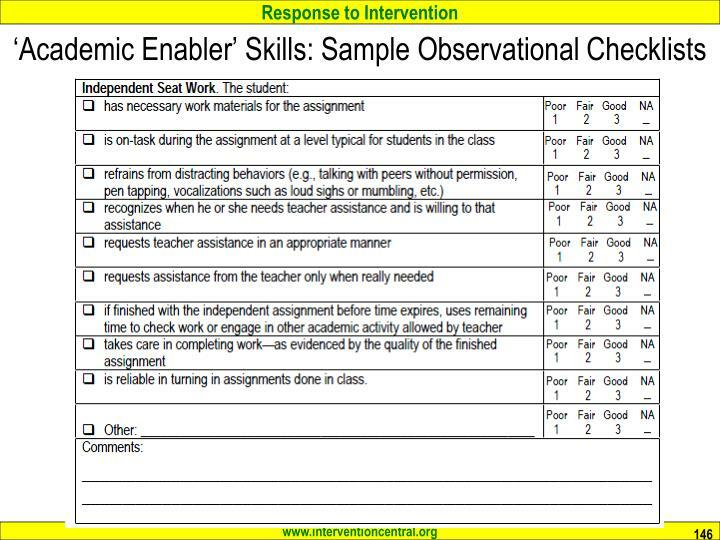 Teachers or other observers can use the academic enabler checklists periodically to monitor student progress during interventions--assessing formatively whether the student is using more of the sub-skills. having an uncluttered desk with only essential work materials. Mr. Havernick monitored the student’s compliance with elements of this organization -skills checklist across three days of math class. On average, Rodney successfully carried out only 2 of the 5 possible subskills (baseline). 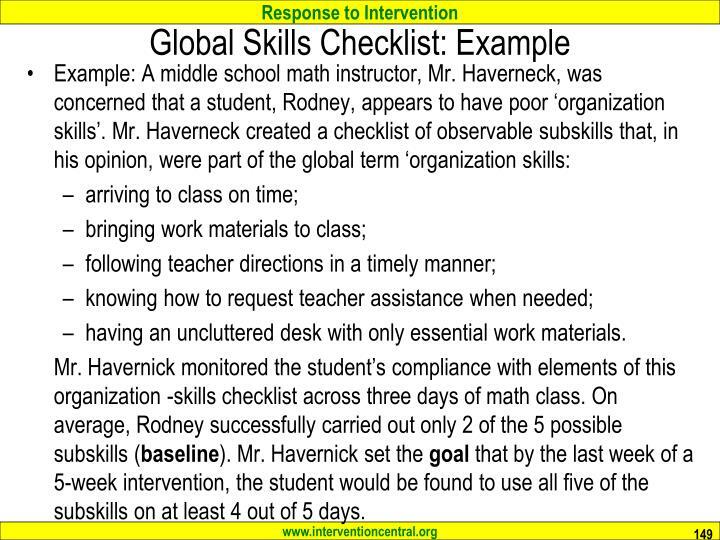 Mr. Havernick set the goal that by the last week of a 5-week intervention, the student would be found to use all five of the subskills on at least 4 out of 5 days. 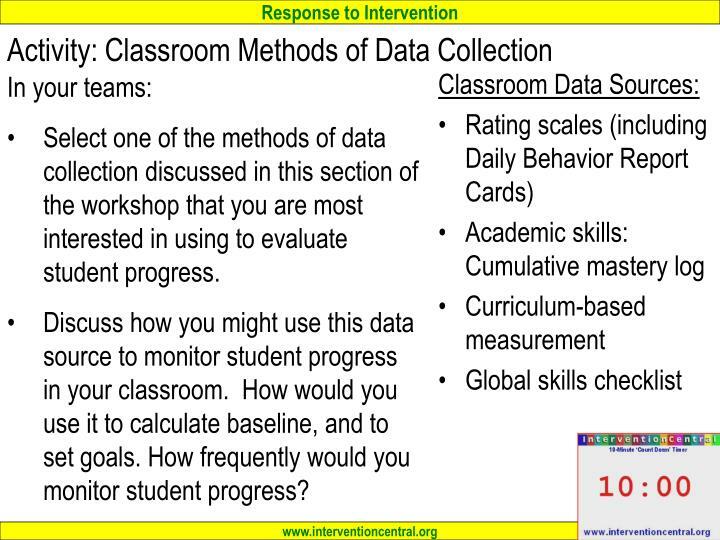 Select one of the methods of data collection discussed in this section of the workshop that you are most interested in using to evaluate student progress. 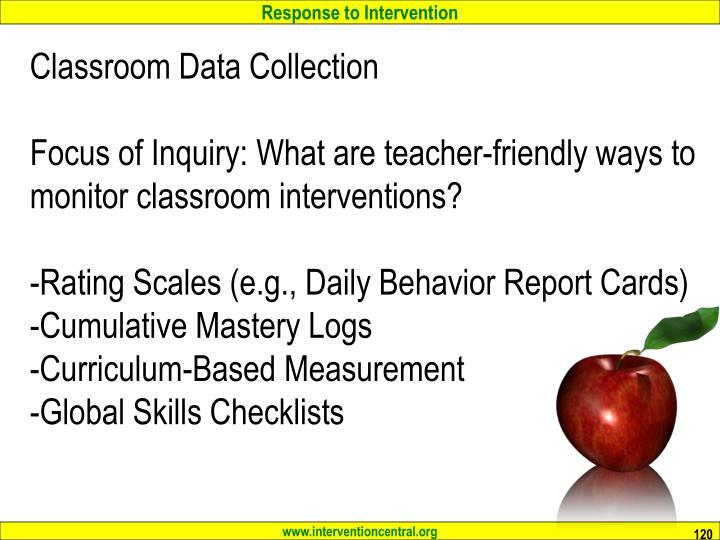 Discuss how you might use this data source to monitor student progress in your classroom. How would you use it to calculate baseline, and to set goals. 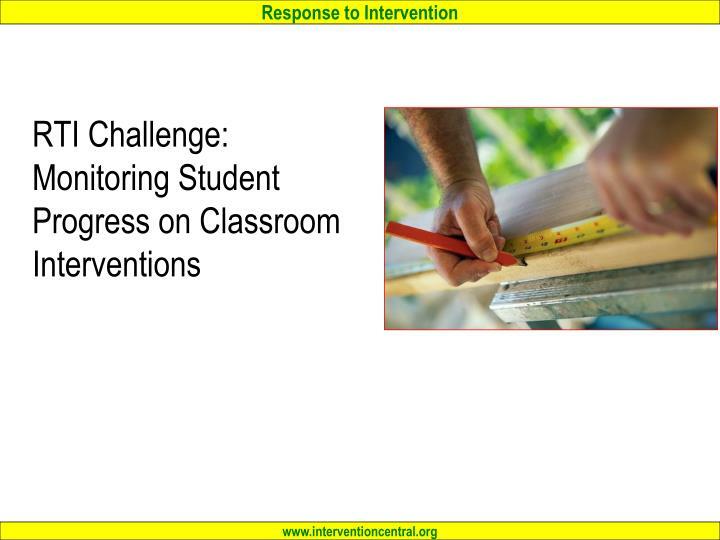 How frequently would you monitor student progress? 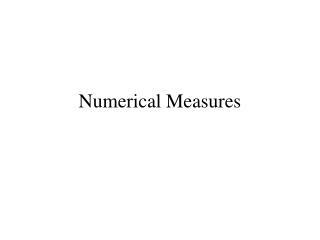 Numerical Measures -. numerical measures. 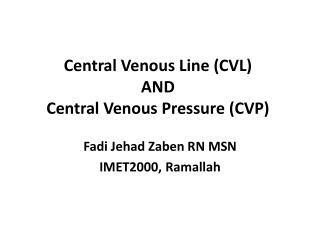 measures of central tendency (location) measures of non central location measure of variability (dispersion, spread) measures of shape. measures of central tendency (location). mean median mode. 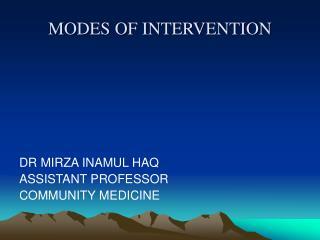 MODES OF INTERVENTION -. dr mirza inamul haq assistant professor community medicine . 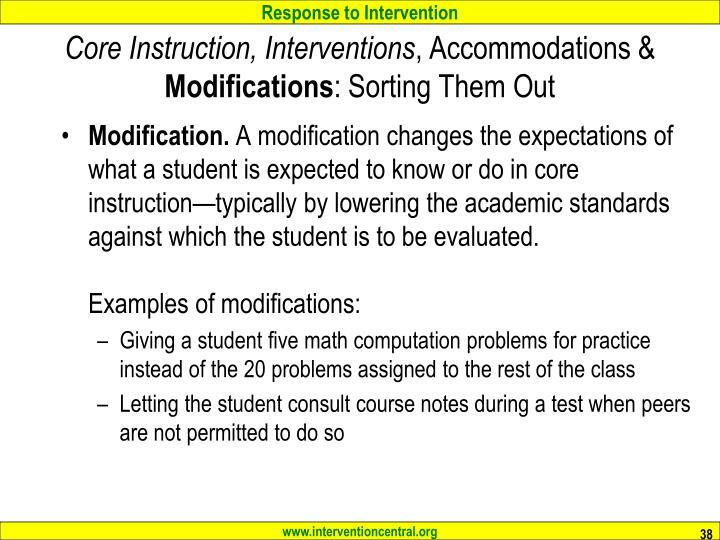 modes of intervention. 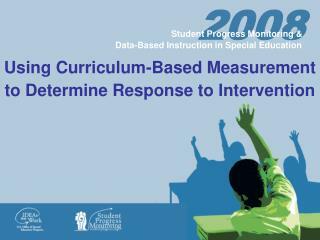 Using Curriculum-Based Measurement to Determine Response to Intervention -2008. student progress monitoring &amp;. 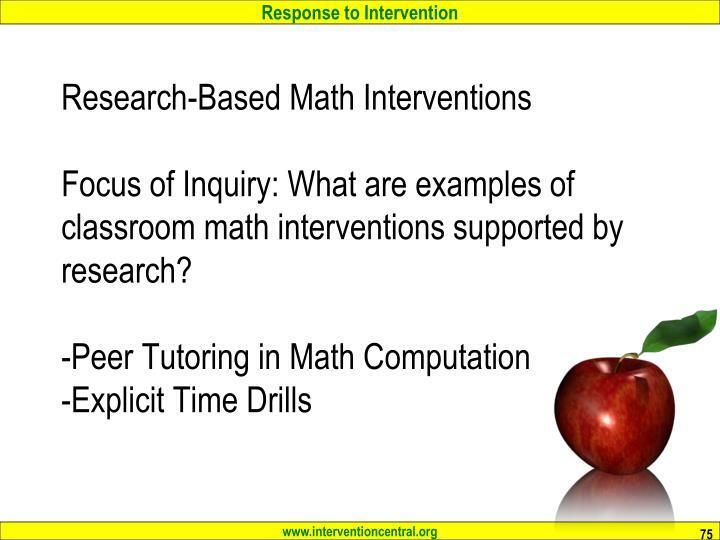 using curriculum-based measurement to determine response to intervention. 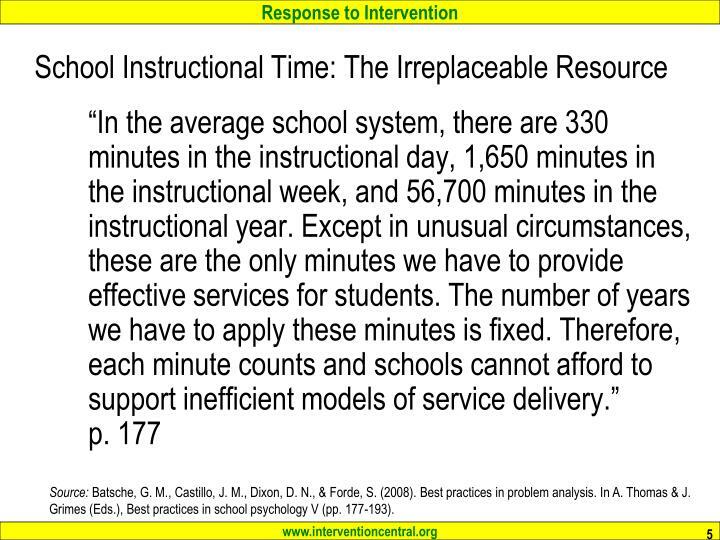 data-based instruction in special education.